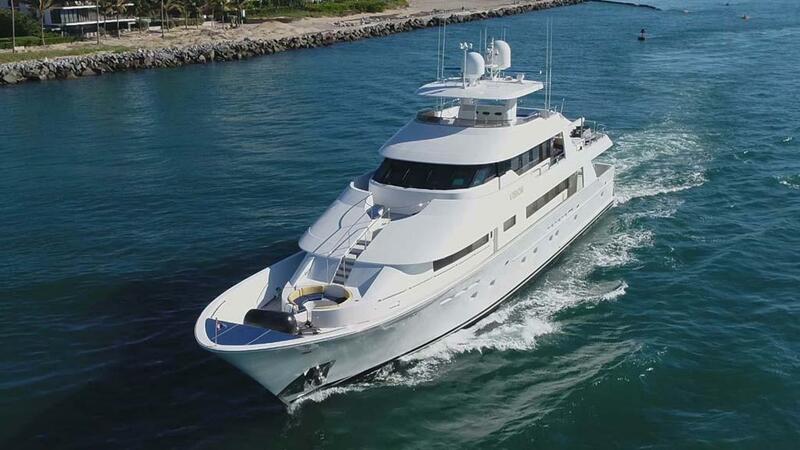 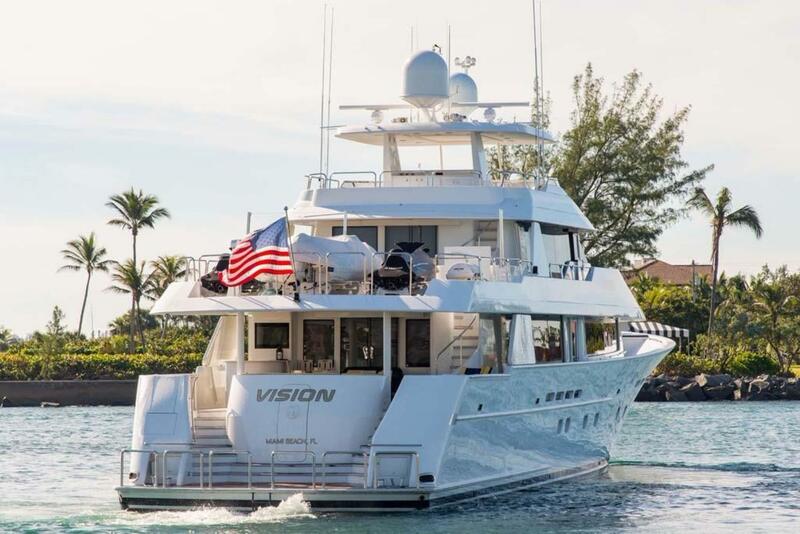 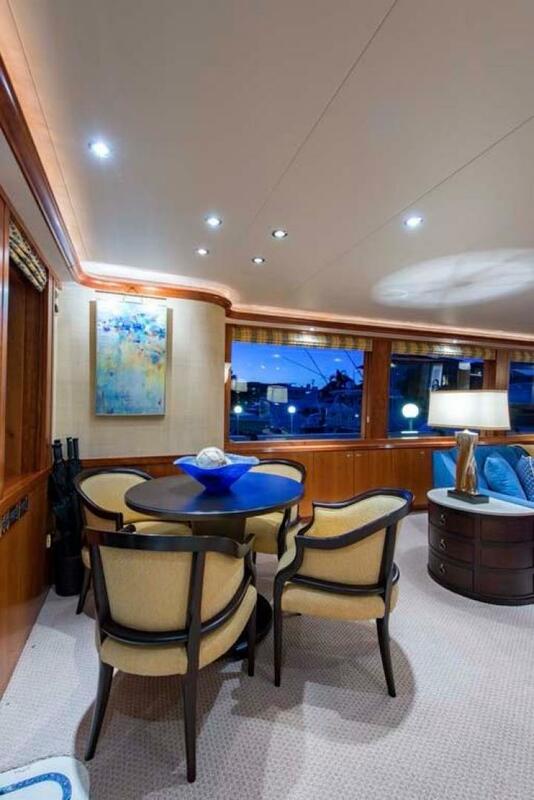 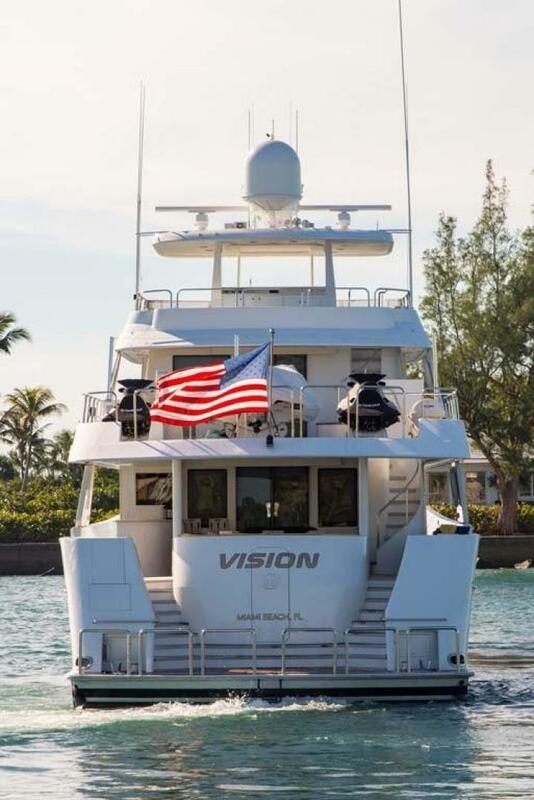 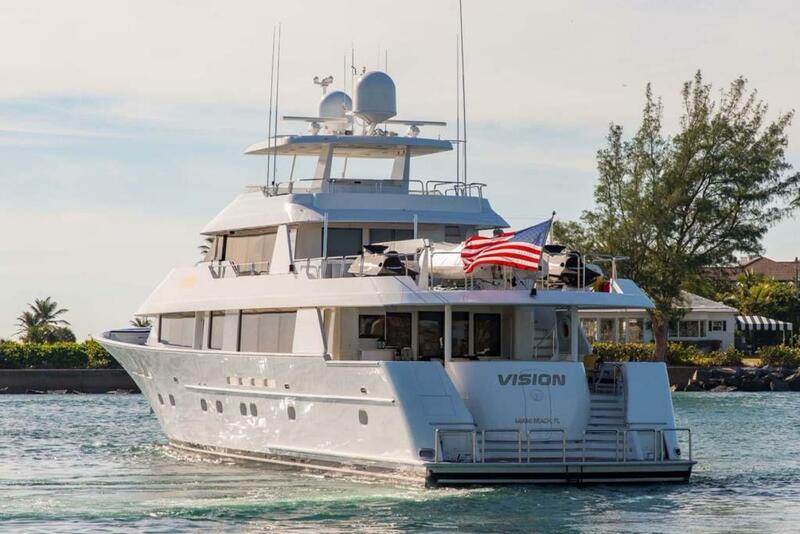 VISION is an impeccably maintained 130 Westport Tri-Deck that can accommodate ten in 5 luxurious staterooms, including an on-deck Master Stateroom and 4 guest staterooms. 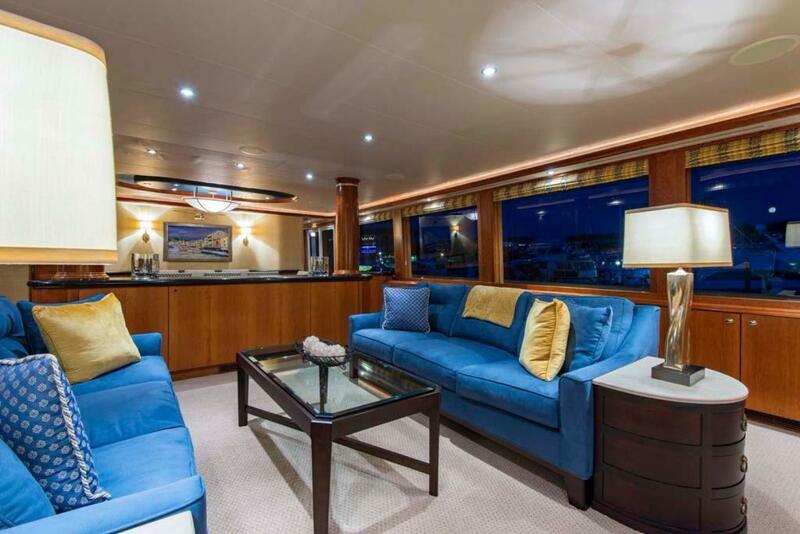 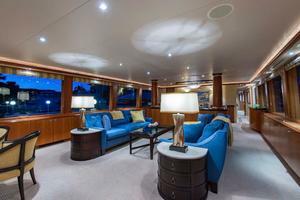 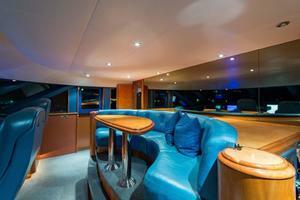 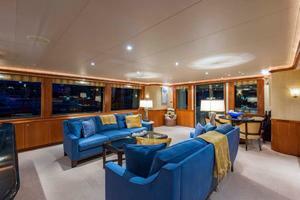 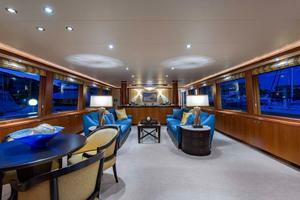 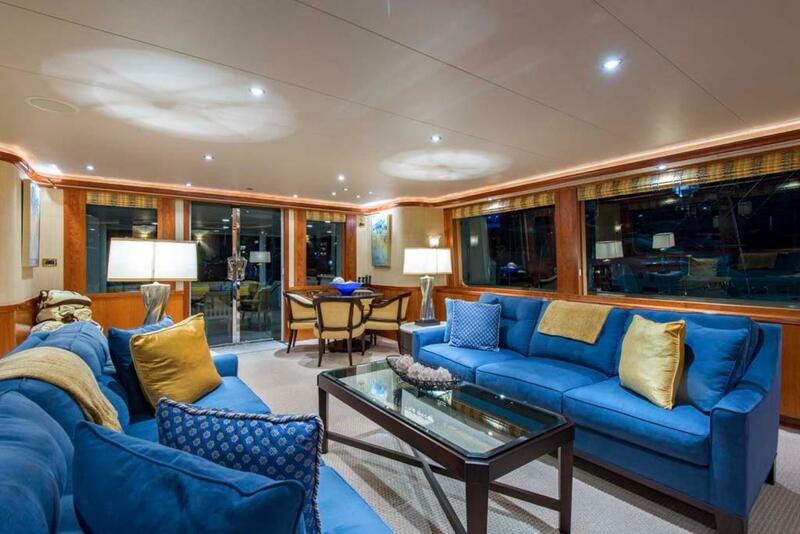 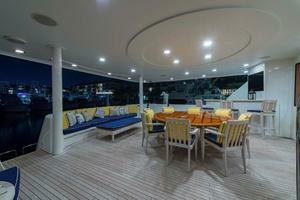 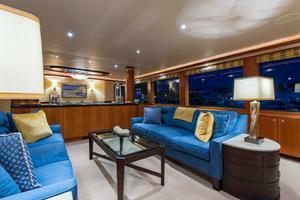 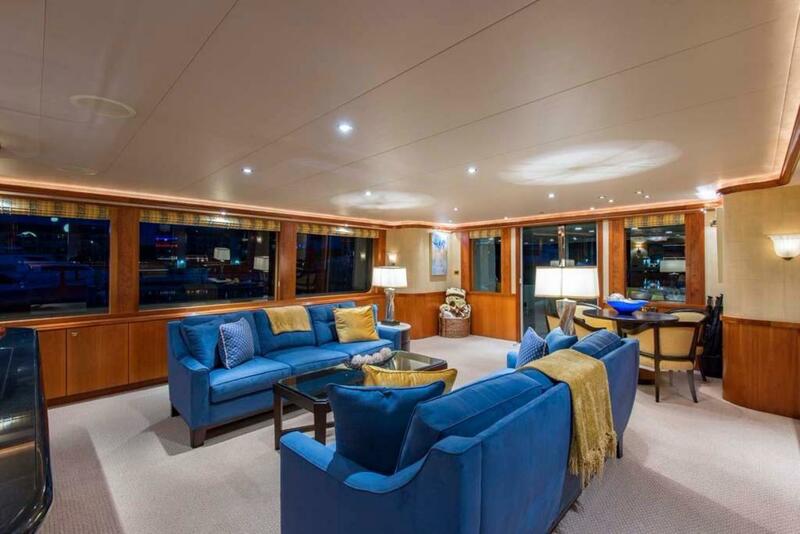 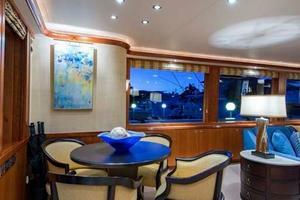 The large salon, dining room, sky lounge, and expansive deck areas ensure enjoyable cruising in comfort. 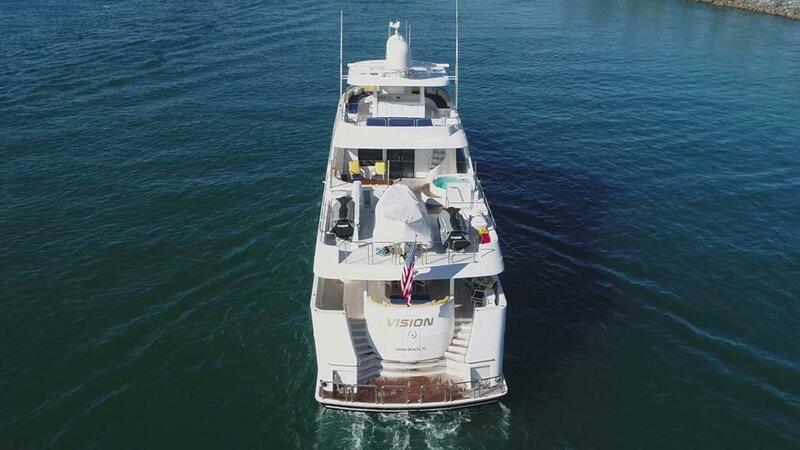 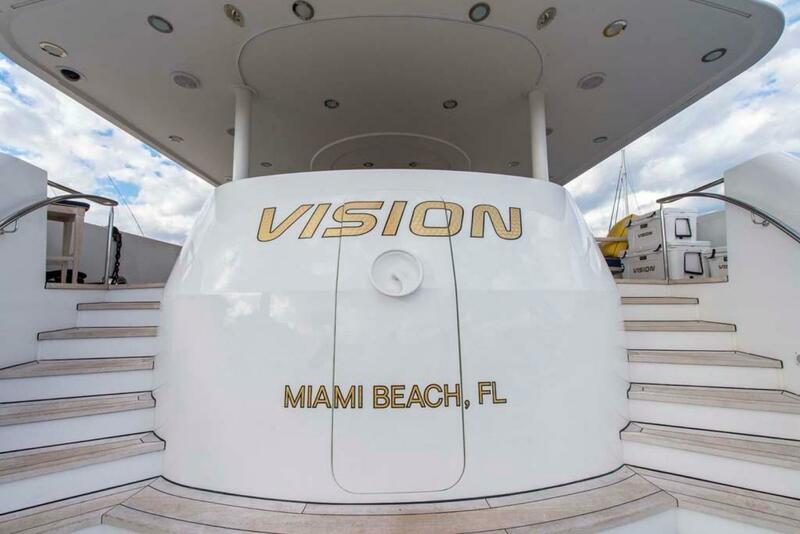 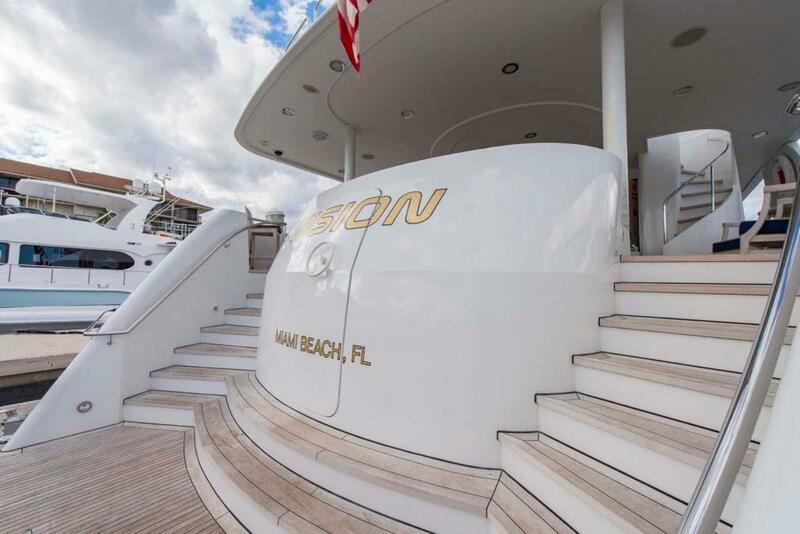 With a cruising speed above 20 knots, a draft of 6.5 feet, and zero-speed stabilizers, Vision is the ideal yacht for reaching the best of the islands, and yet still capable of a generous cruising range of 3450 miles to take you anywhere you want to go. 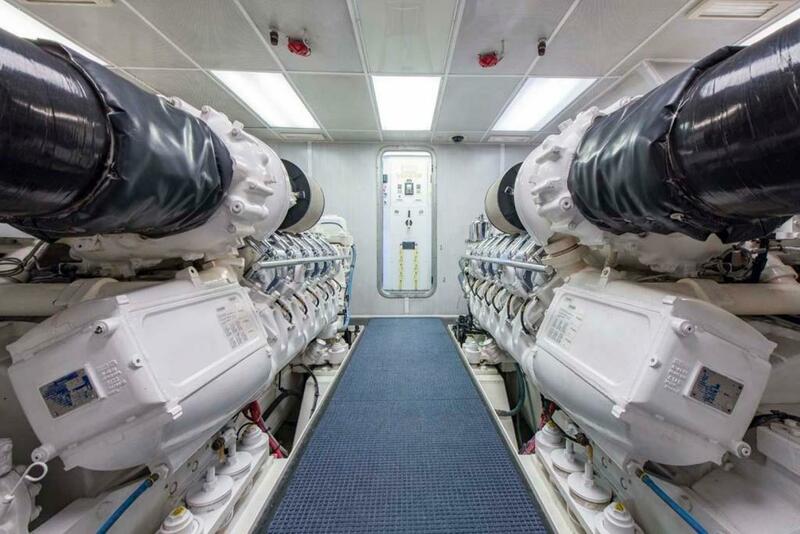 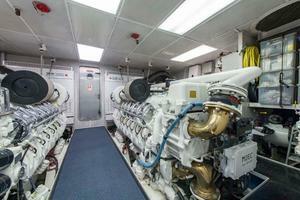 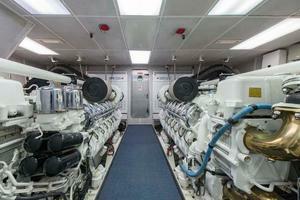 QL3 service on both main engines performed in January 2018, including an updated head design and a 1-year World-Wide warranty for all parts and labor. 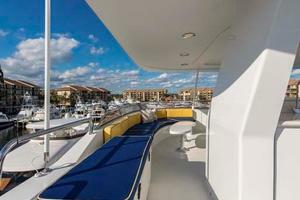 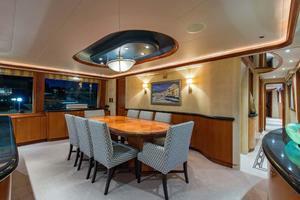 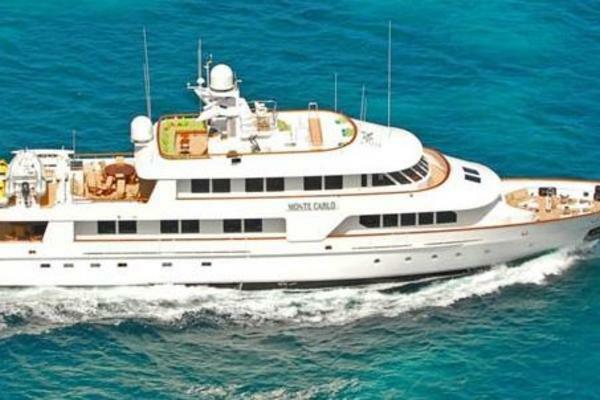 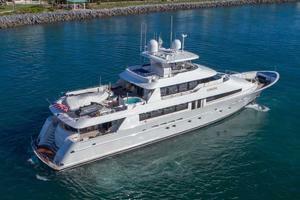 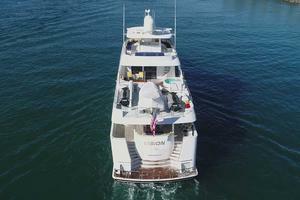 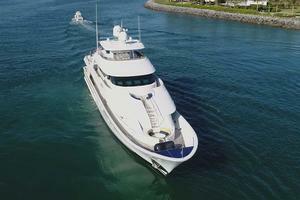 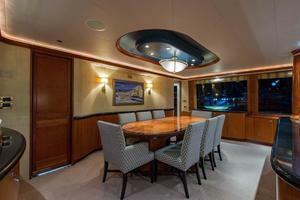 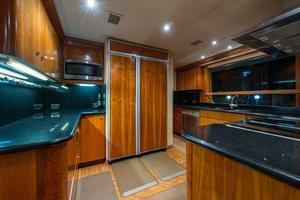 United Yacht Sales Emerald Coast would love to guide you through a personal showing of this 130' Westport Tri-Deck 2003. 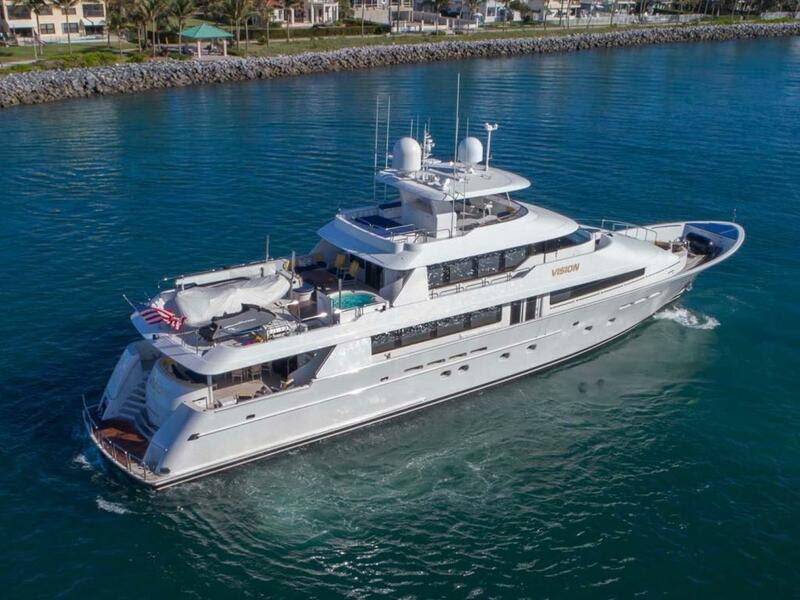 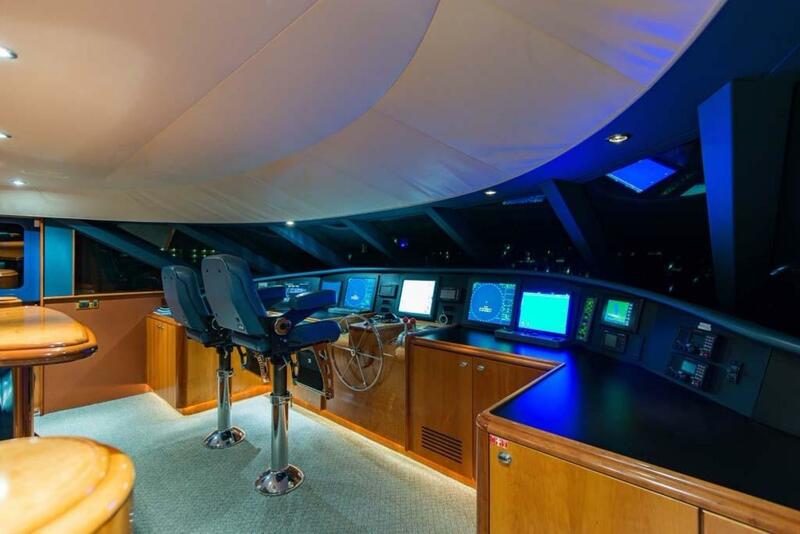 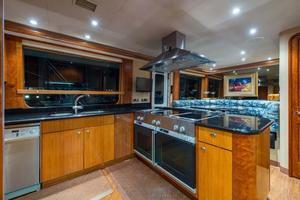 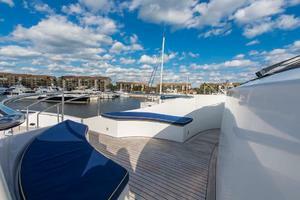 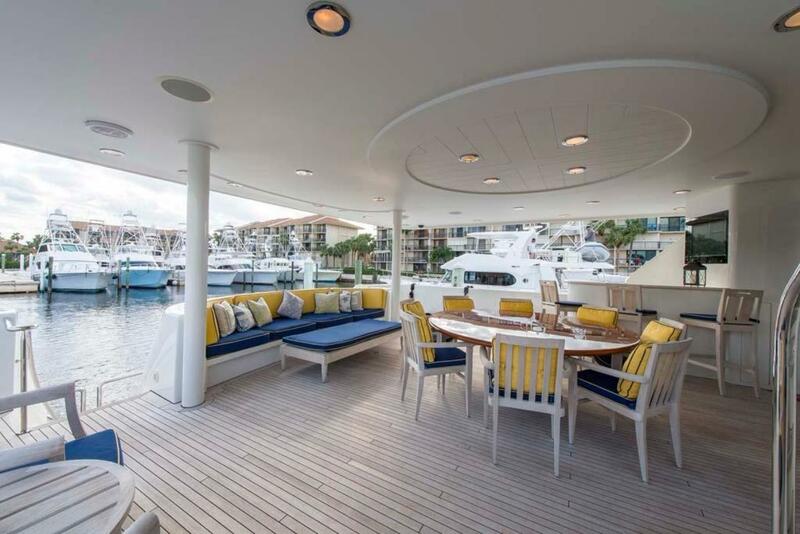 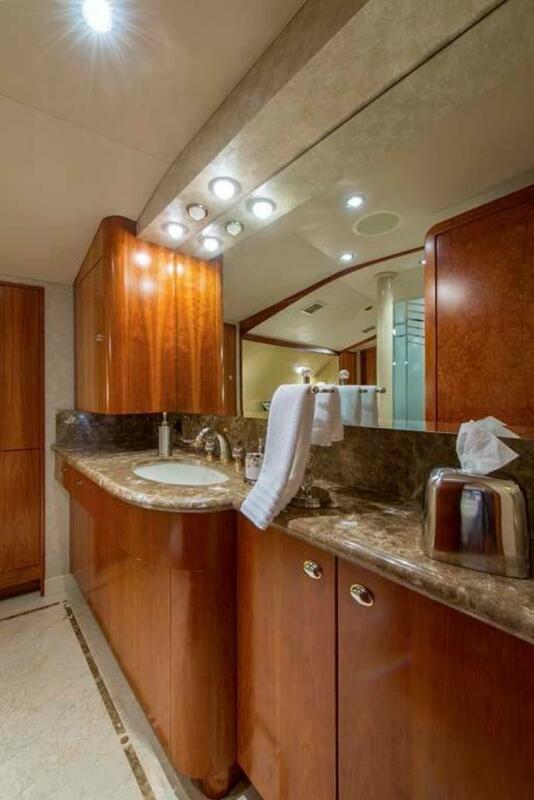 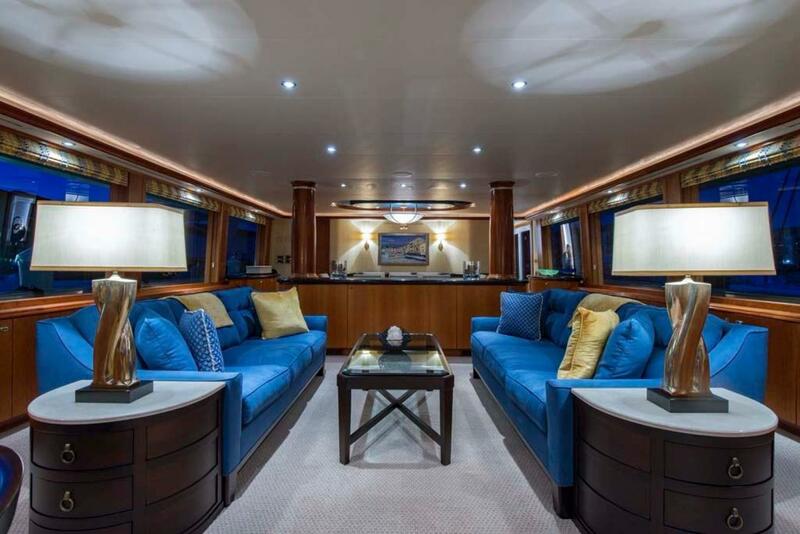 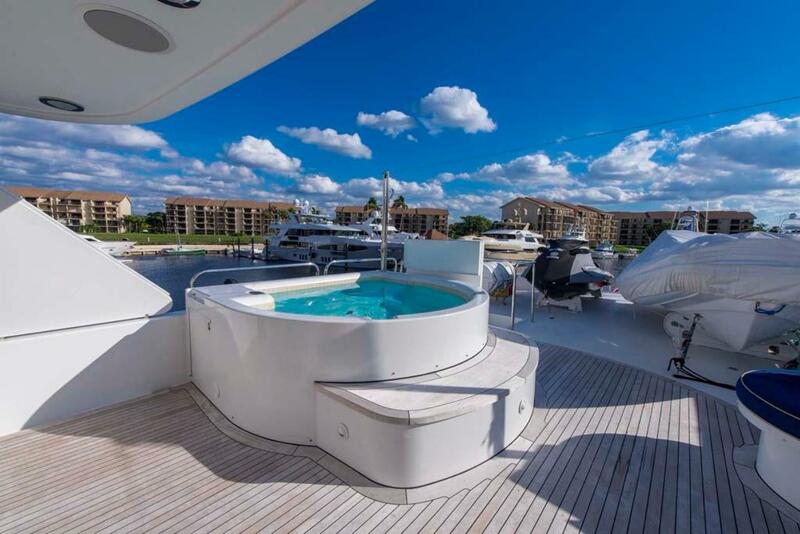 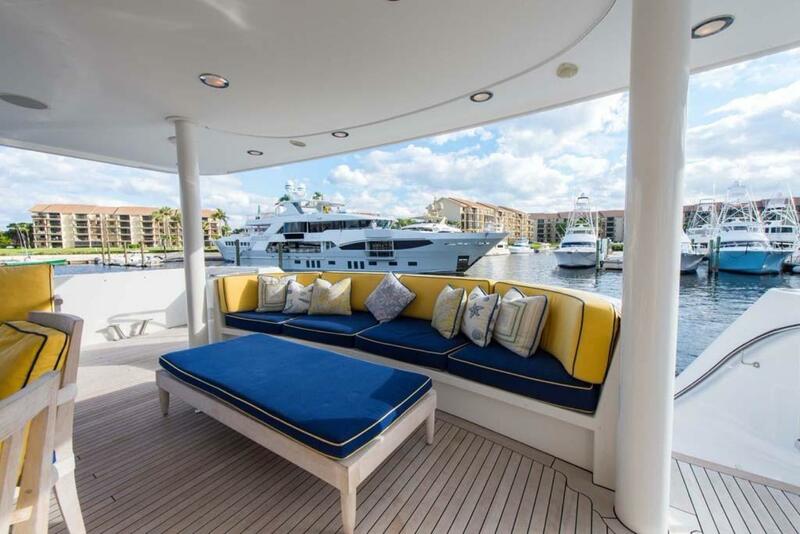 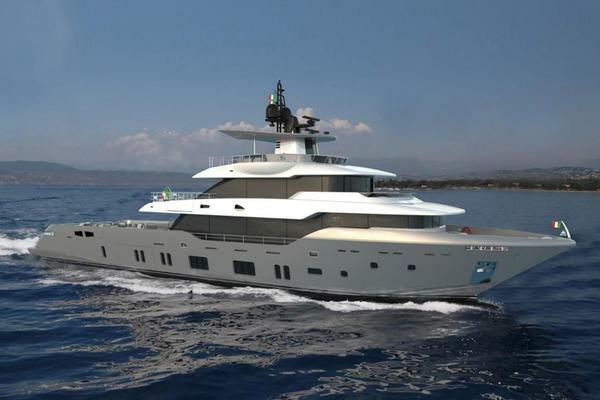 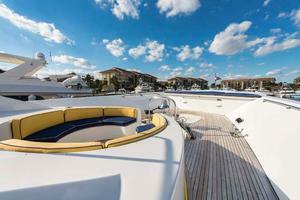 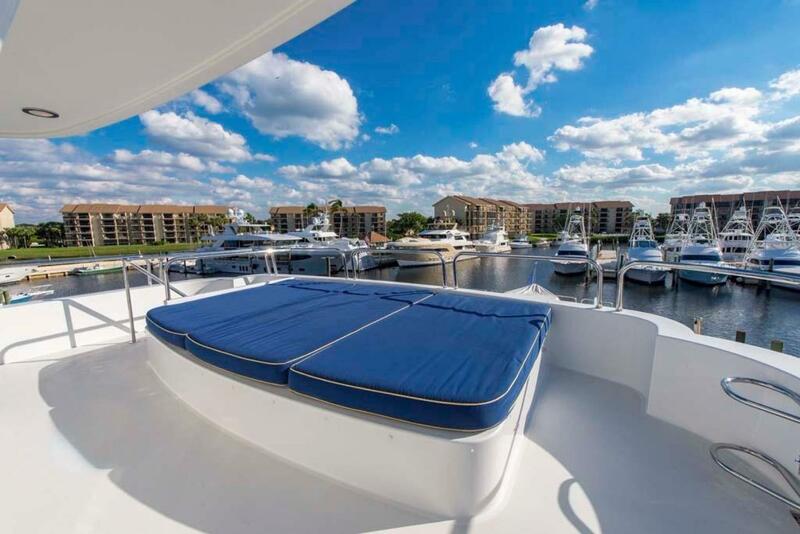 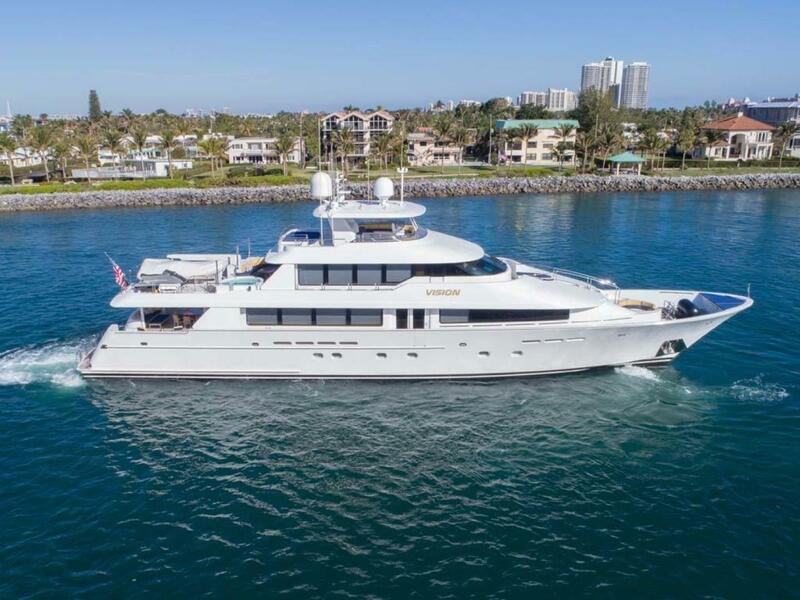 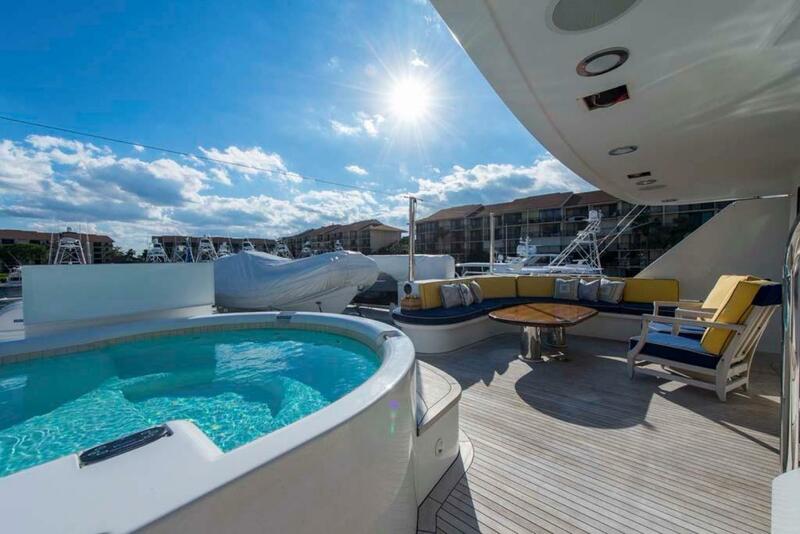 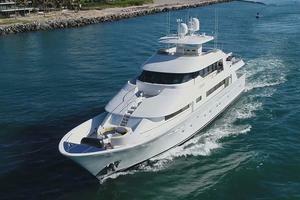 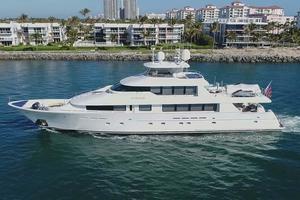 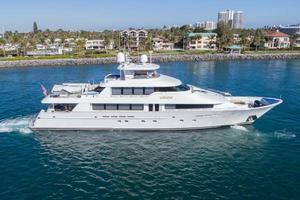 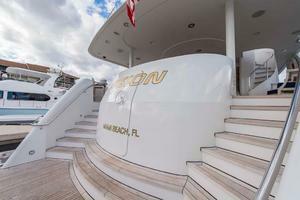 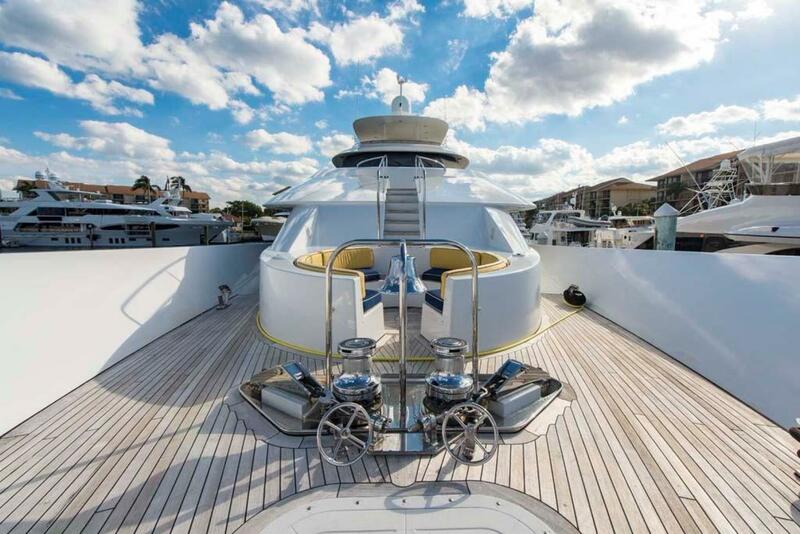 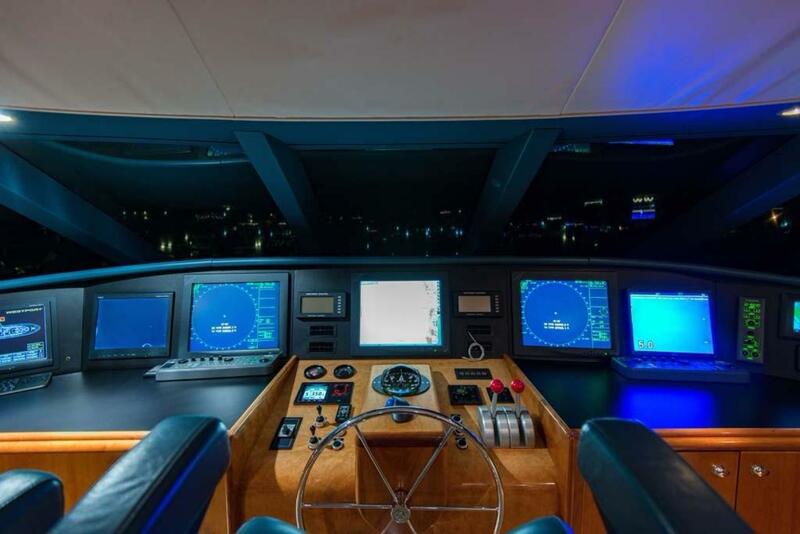 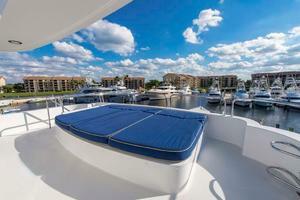 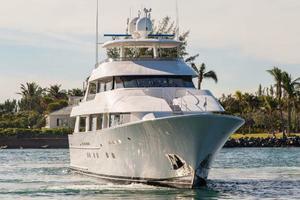 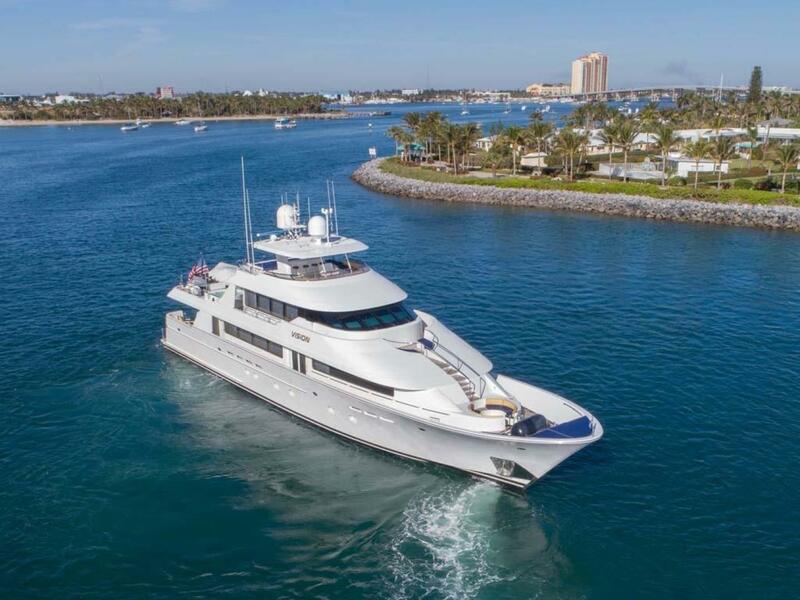 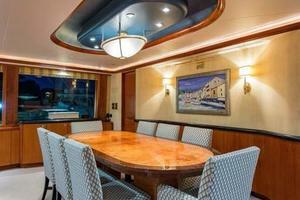 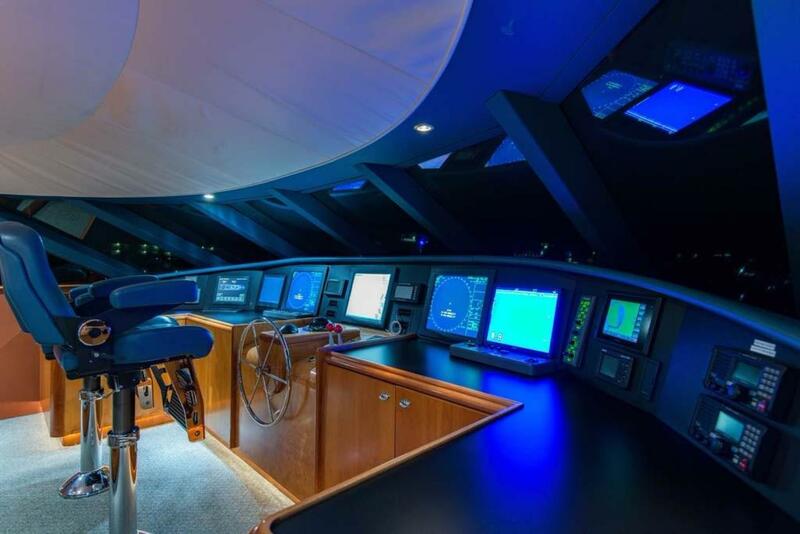 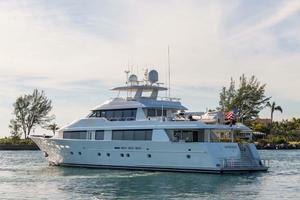 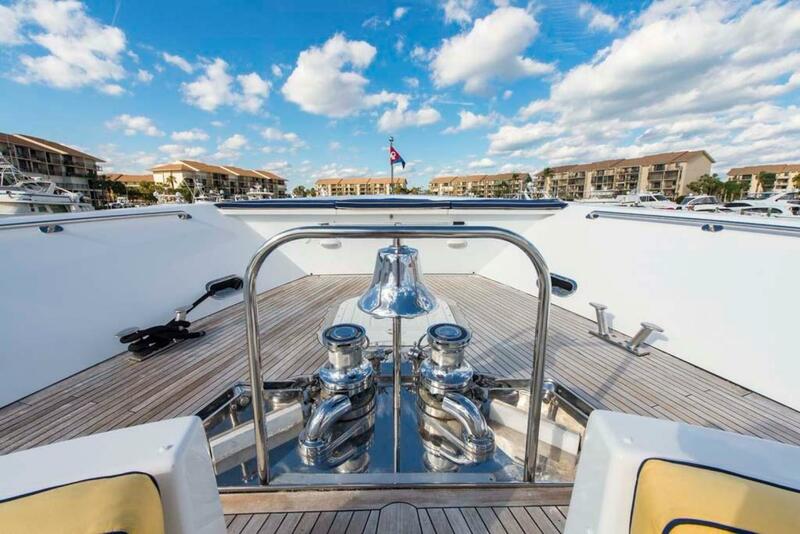 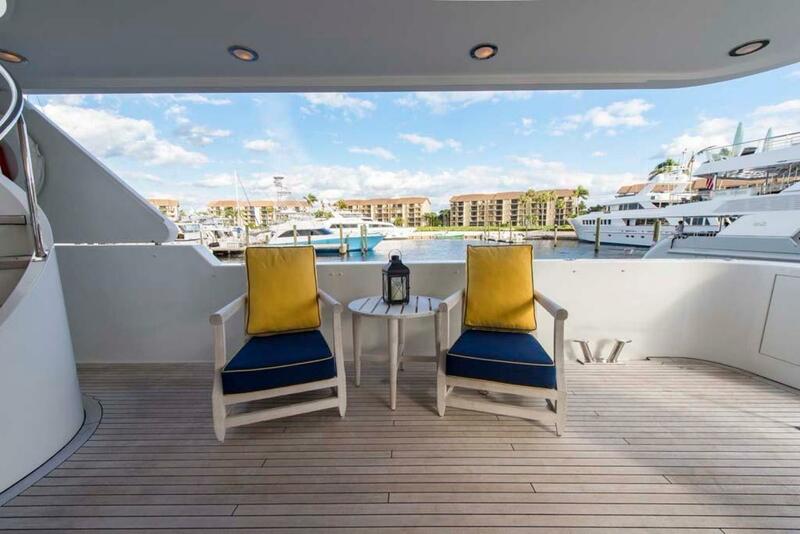 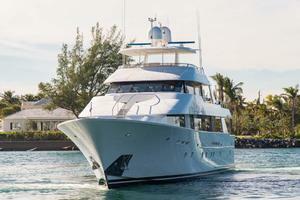 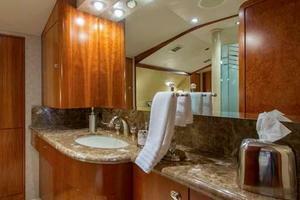 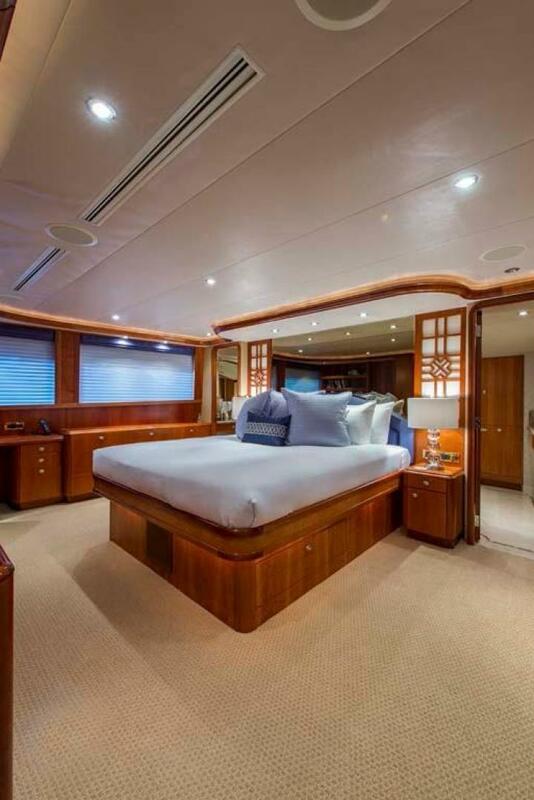 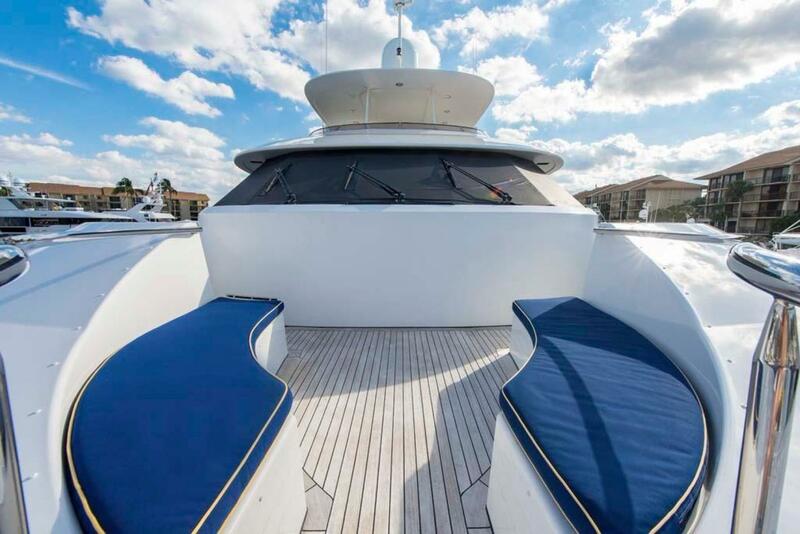 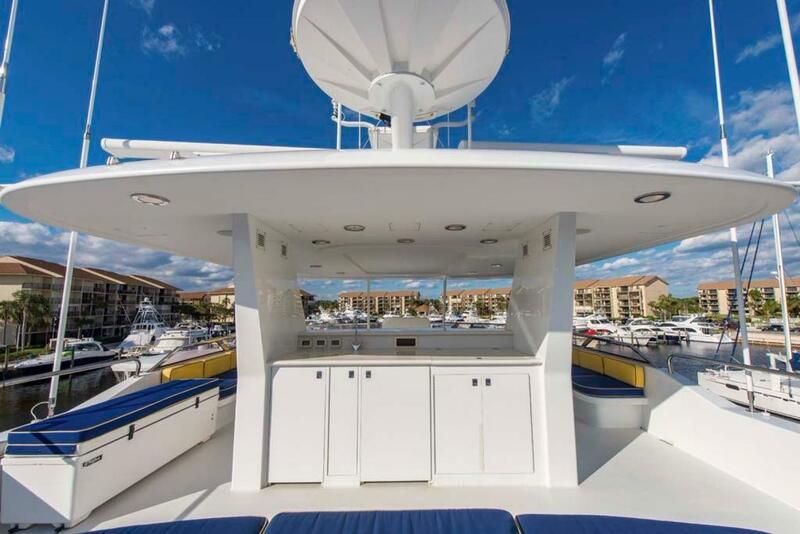 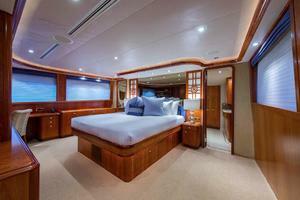 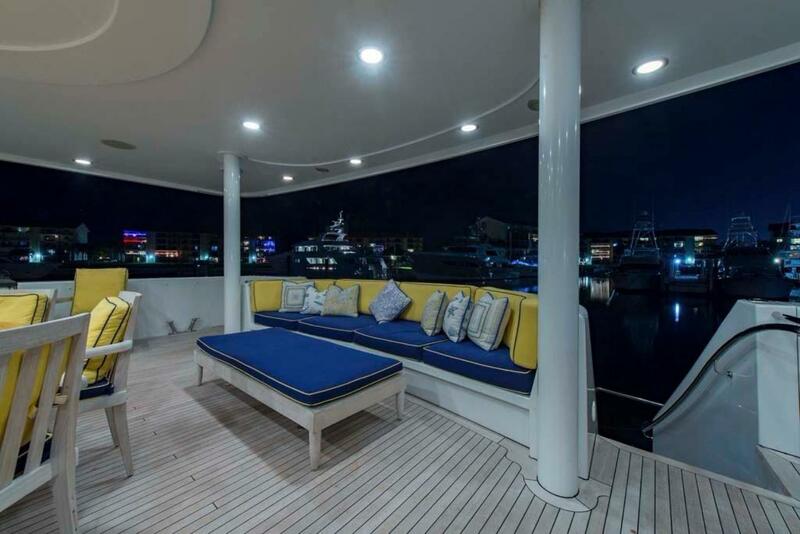 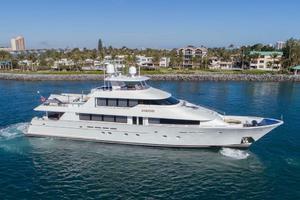 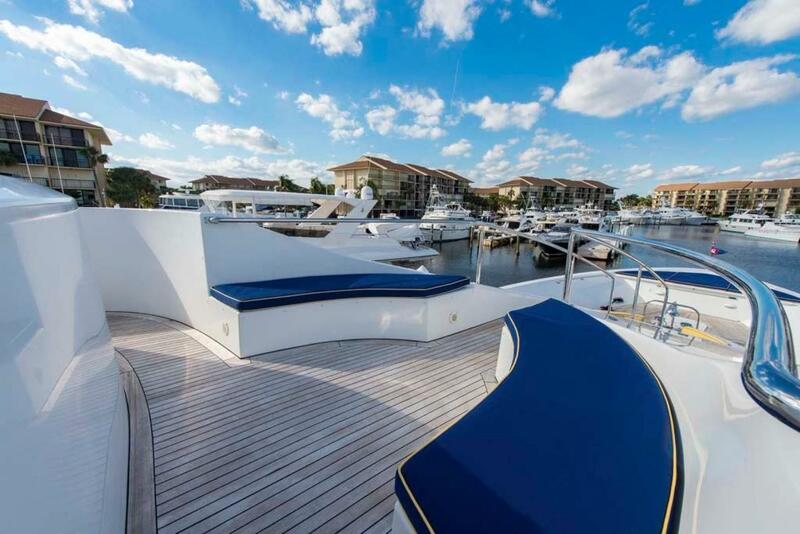 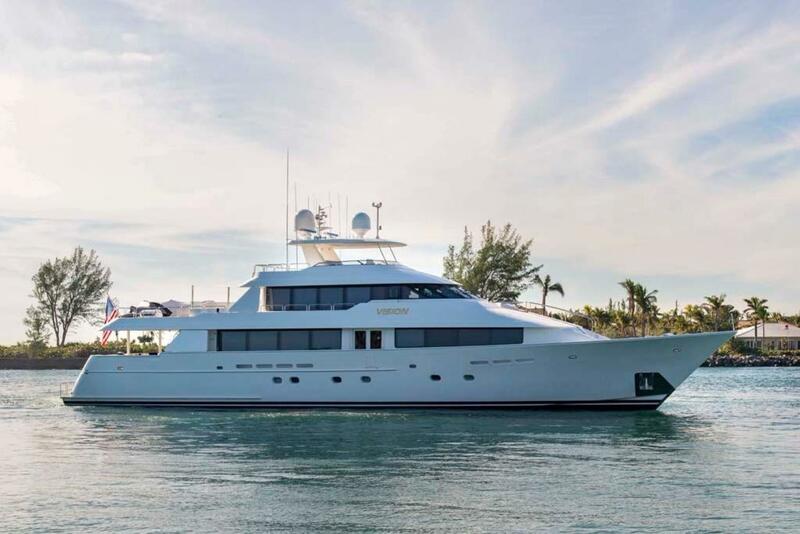 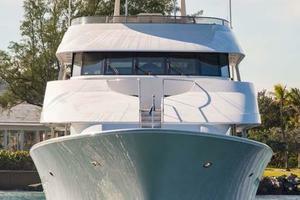 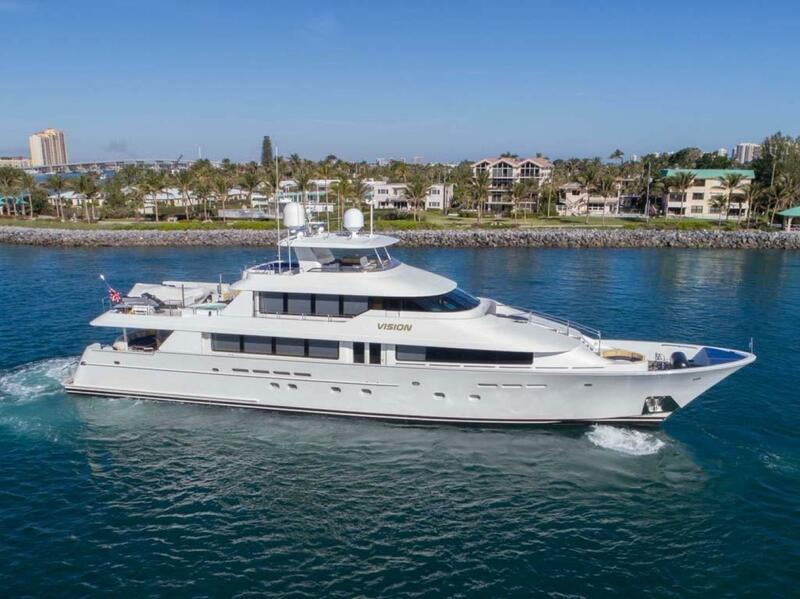 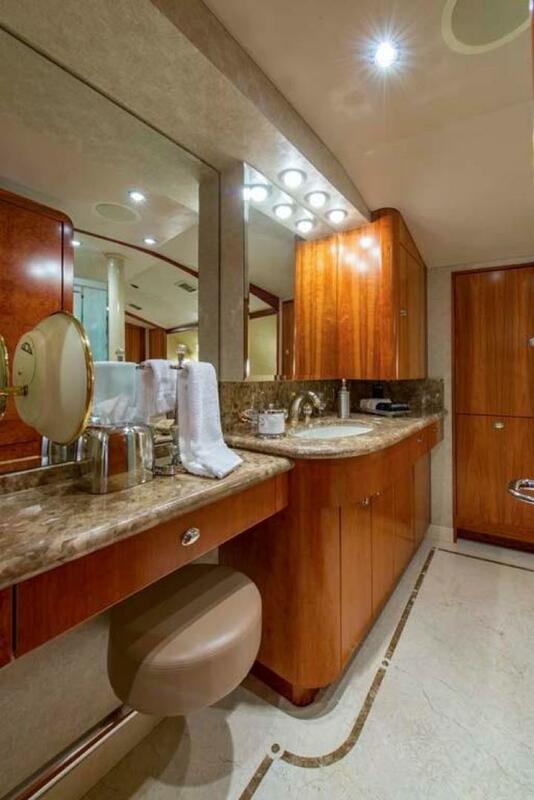 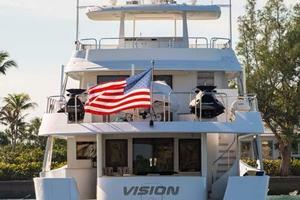 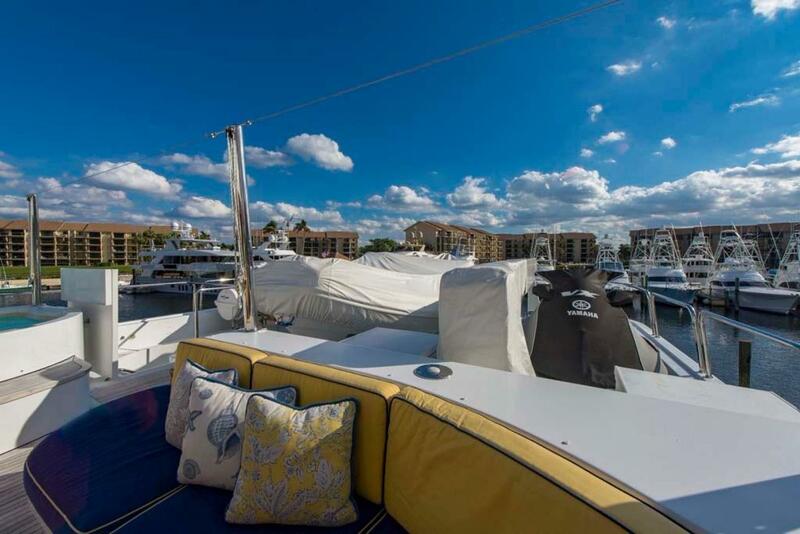 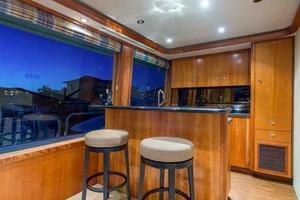 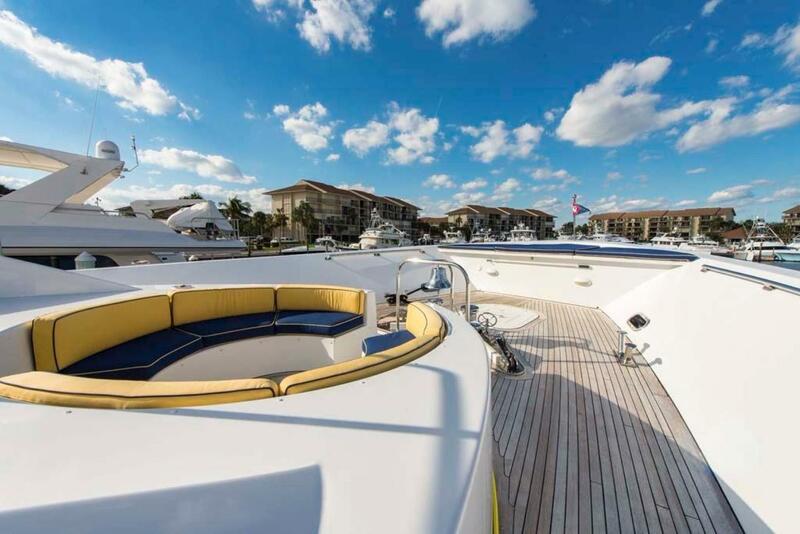 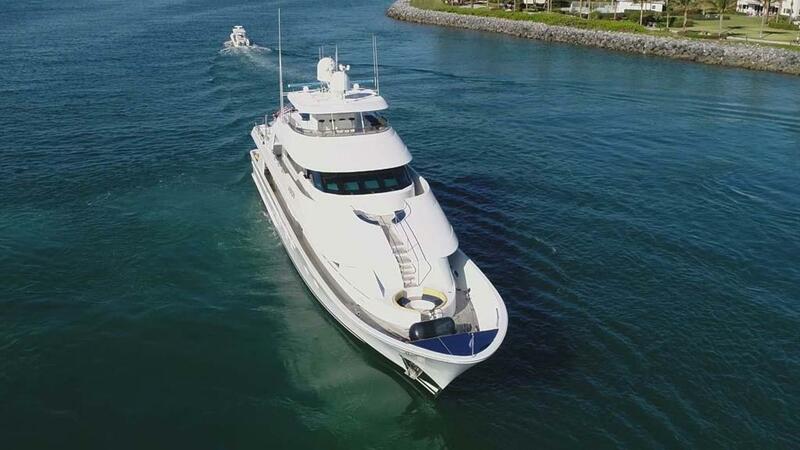 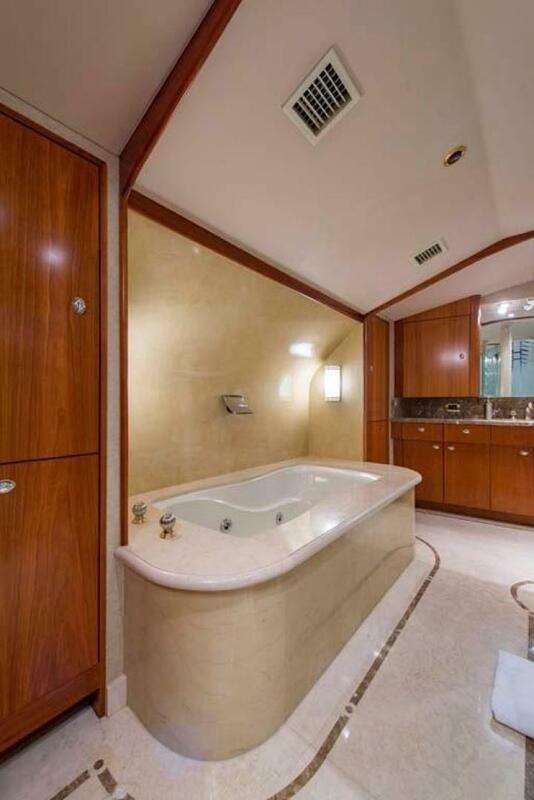 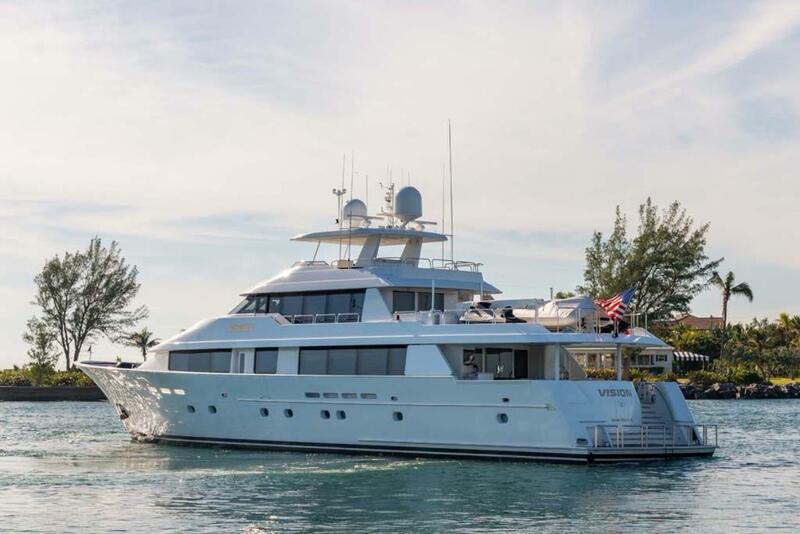 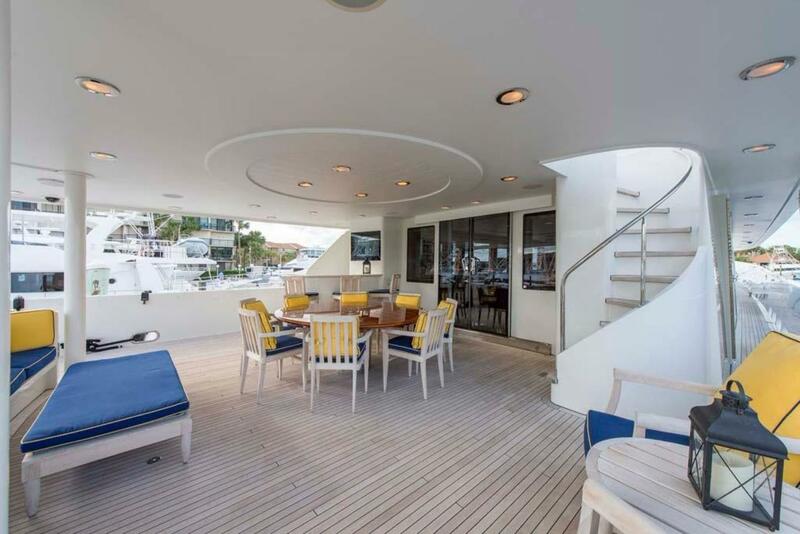 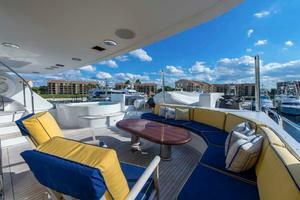 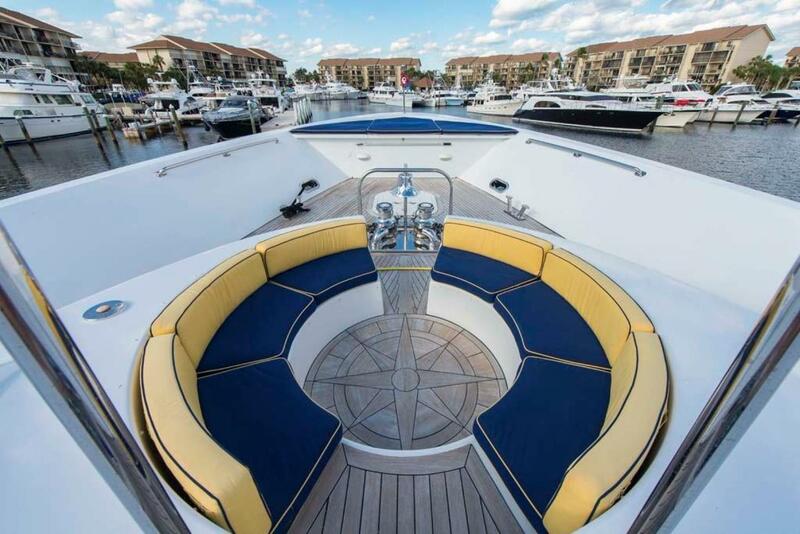 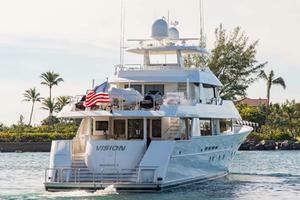 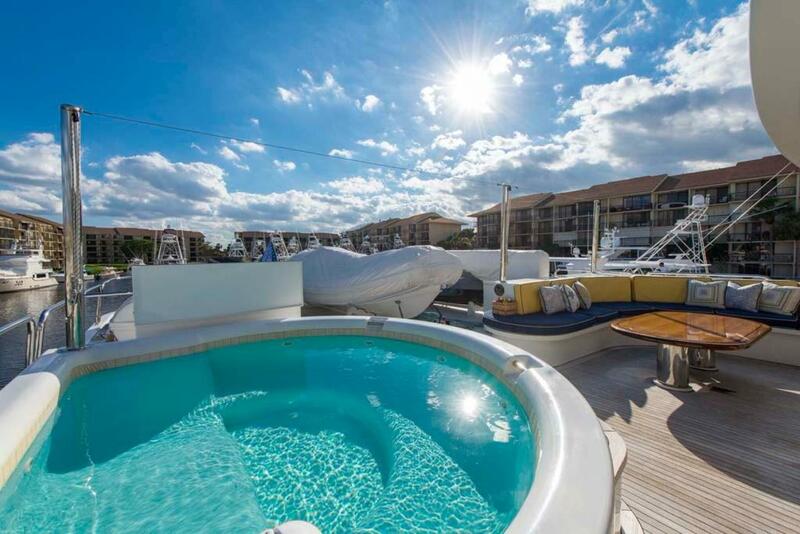 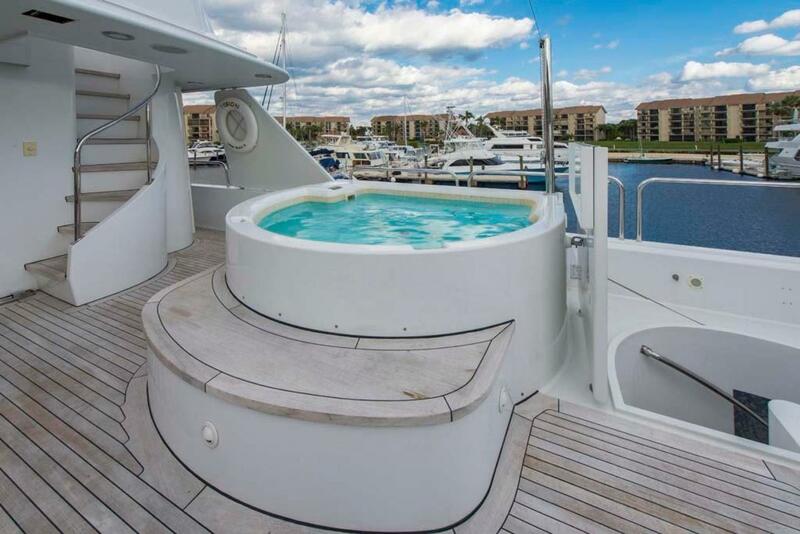 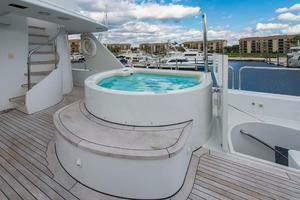 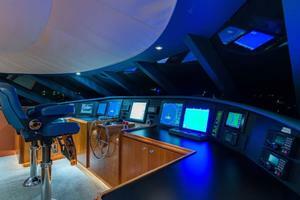 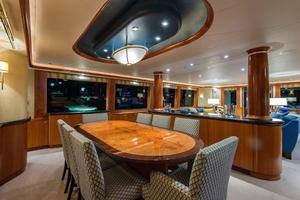 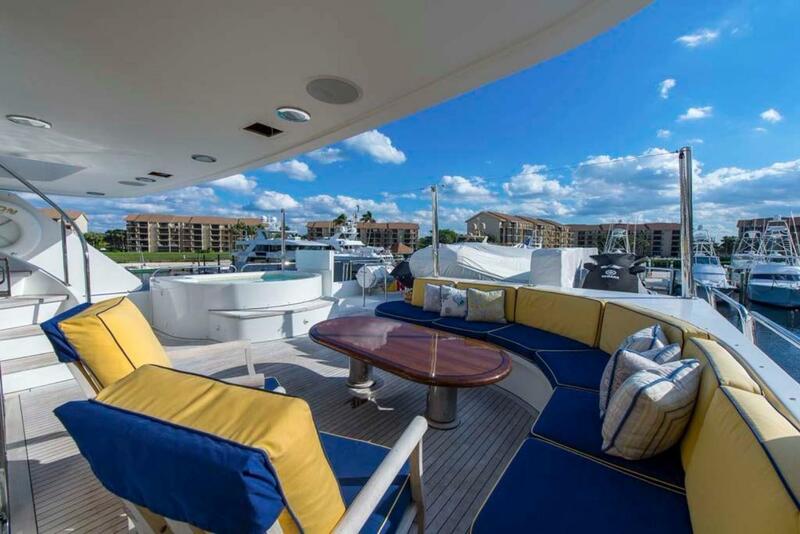 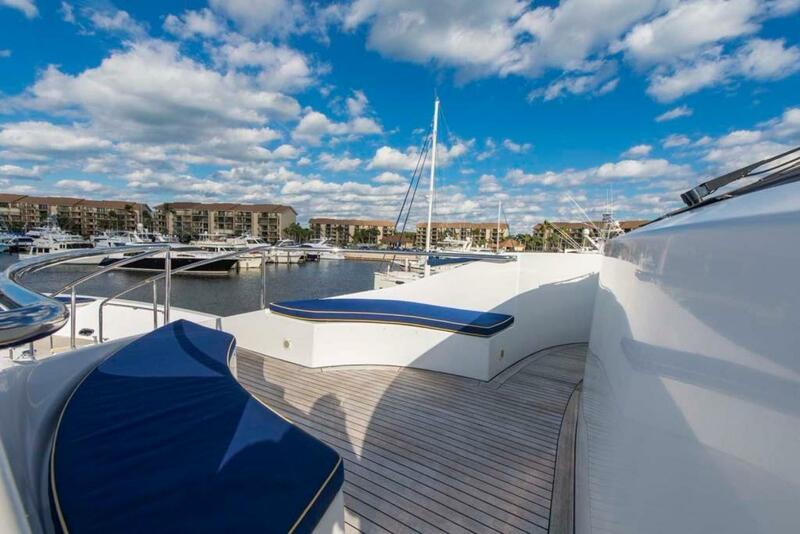 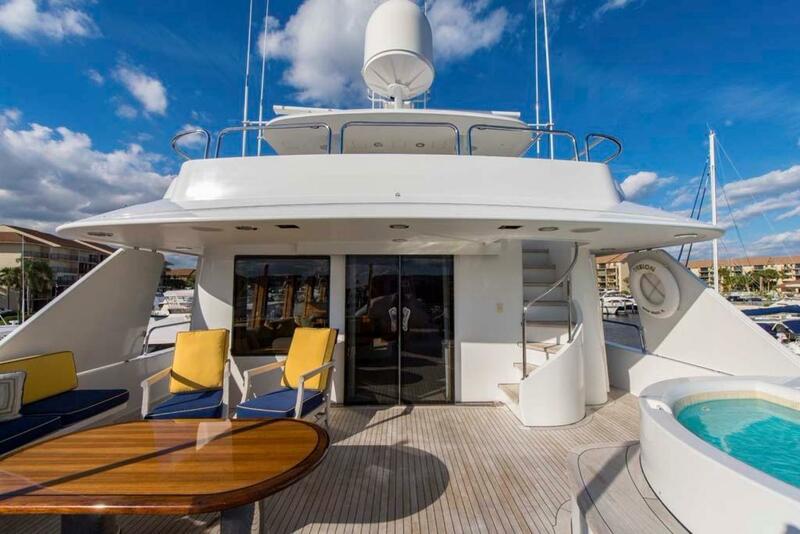 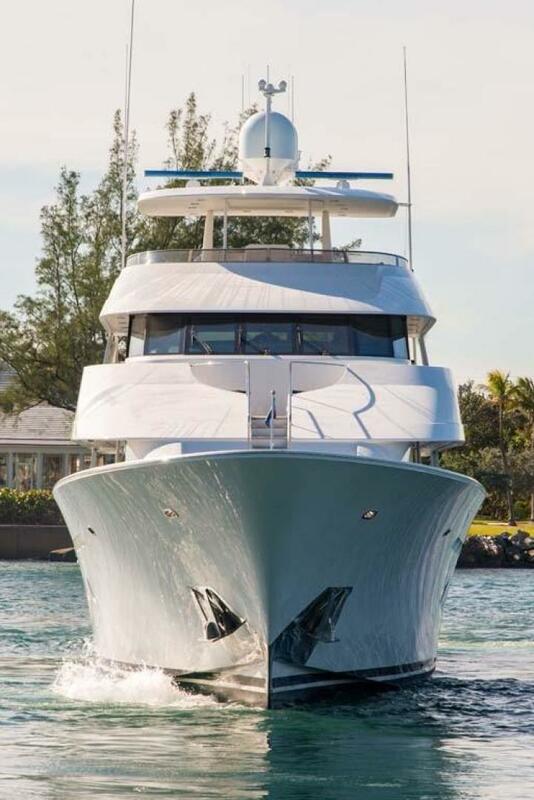 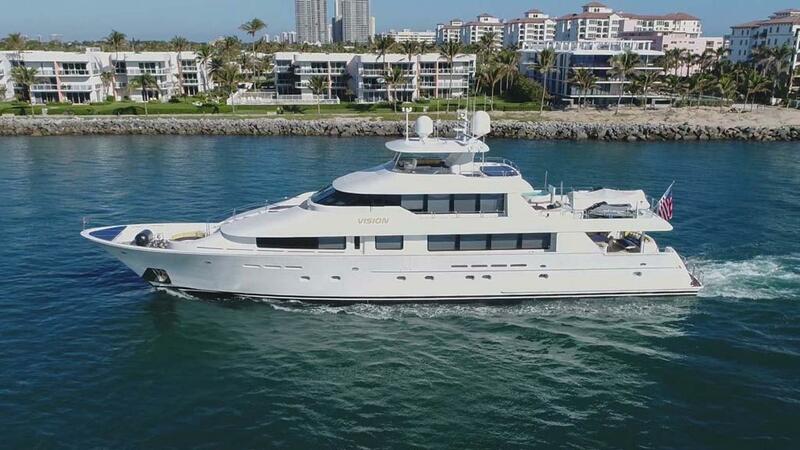 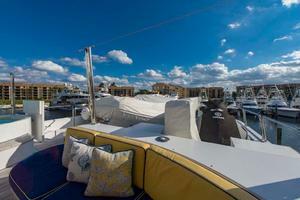 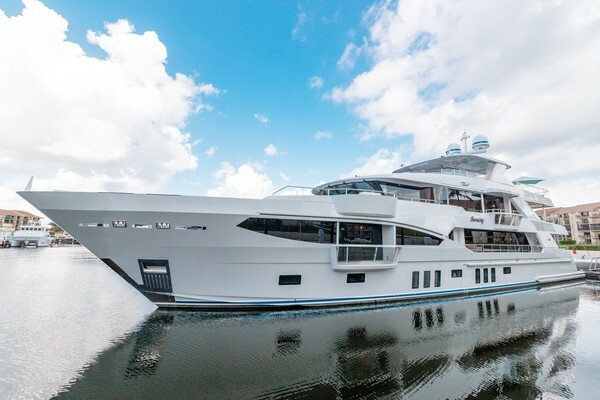 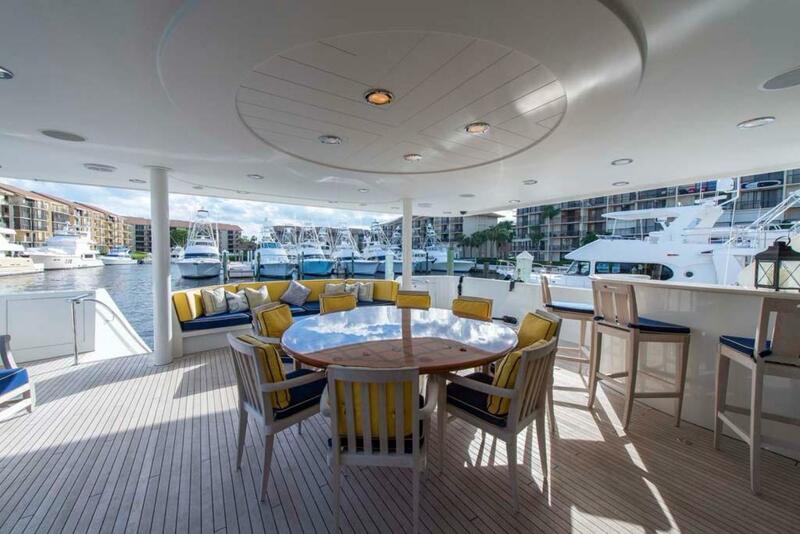 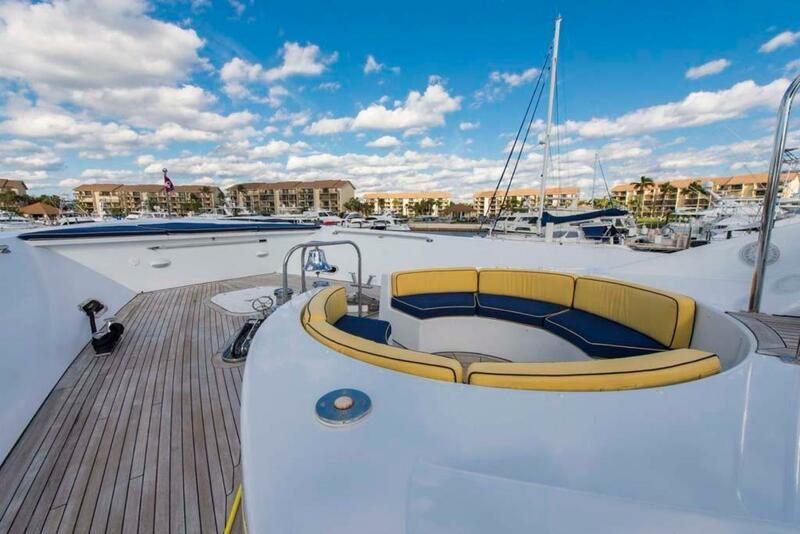 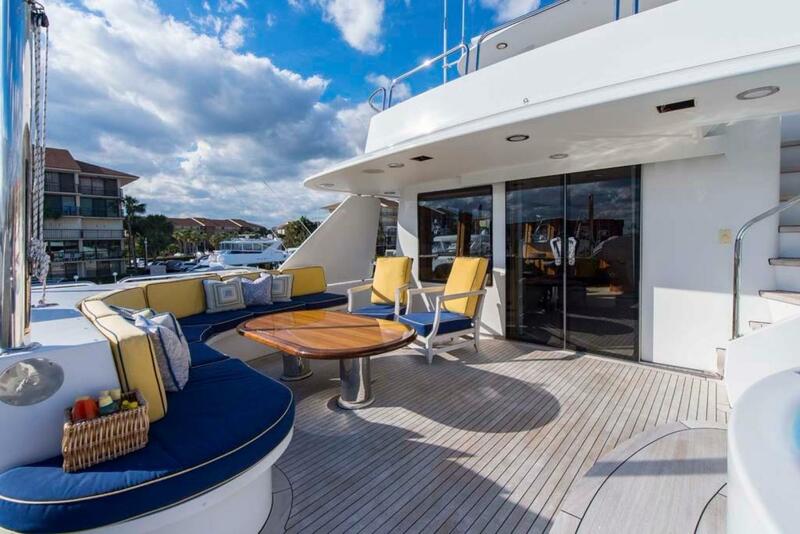 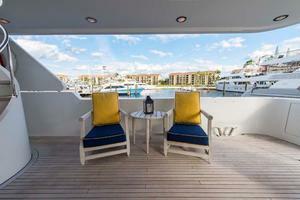 This yacht for sale is located in Jupiter, Florida and priced at $7,995,000. For a showing please contact us by filling out the form on this page and we will get back to you shortly! 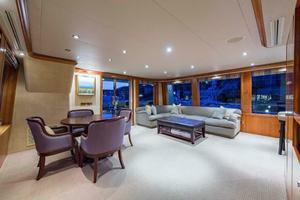 The foyer will lead you aft to the spacious Main Salon and formal dining area. 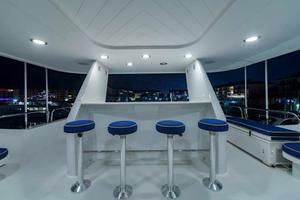 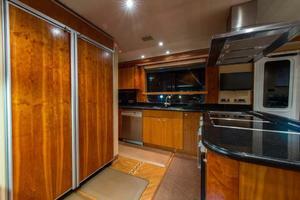 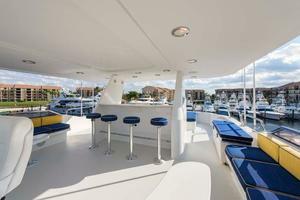 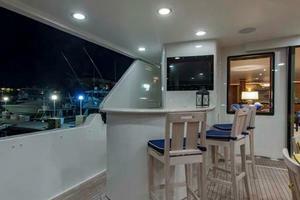 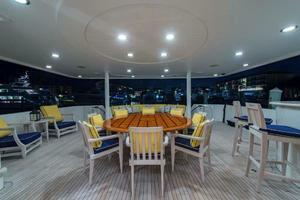 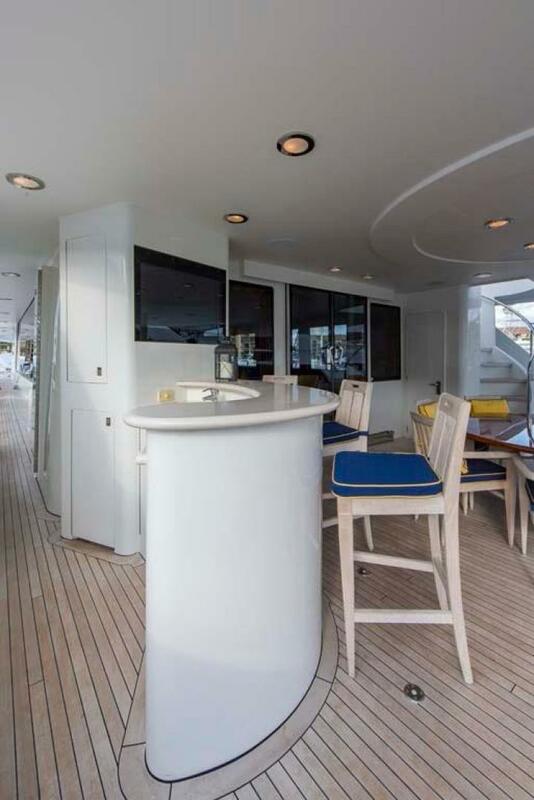 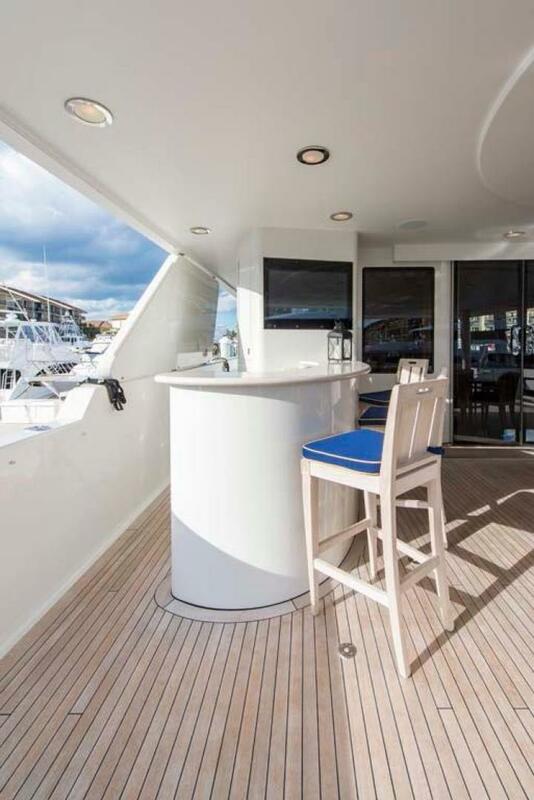 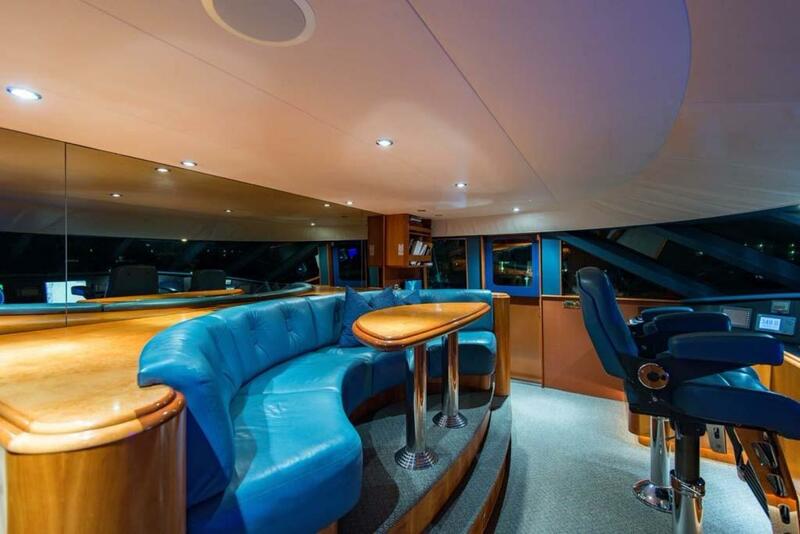 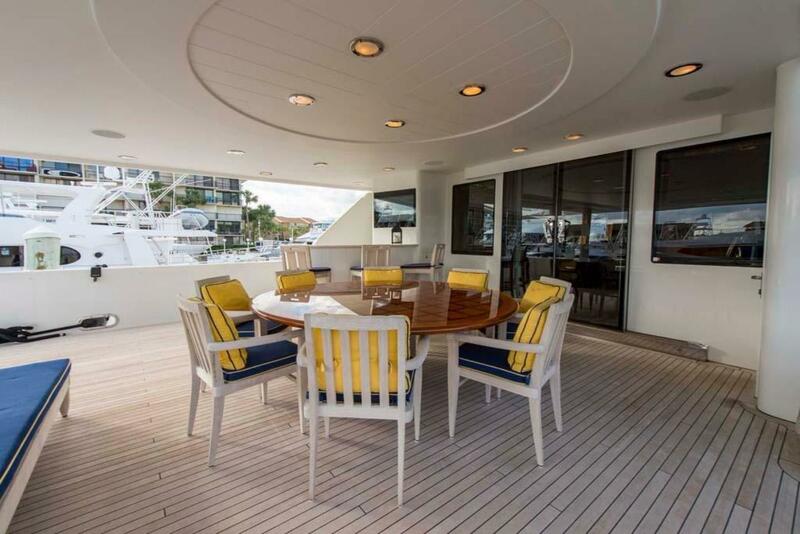 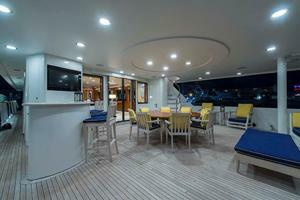 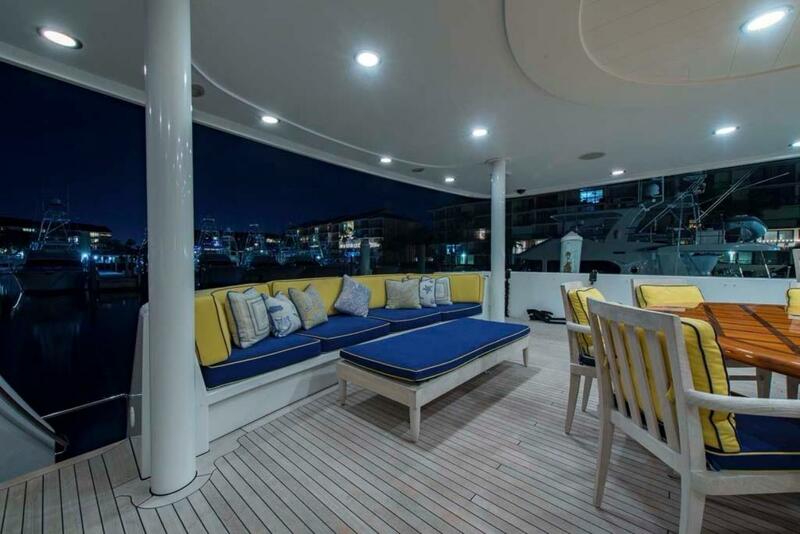 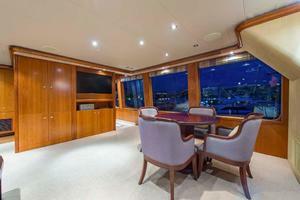 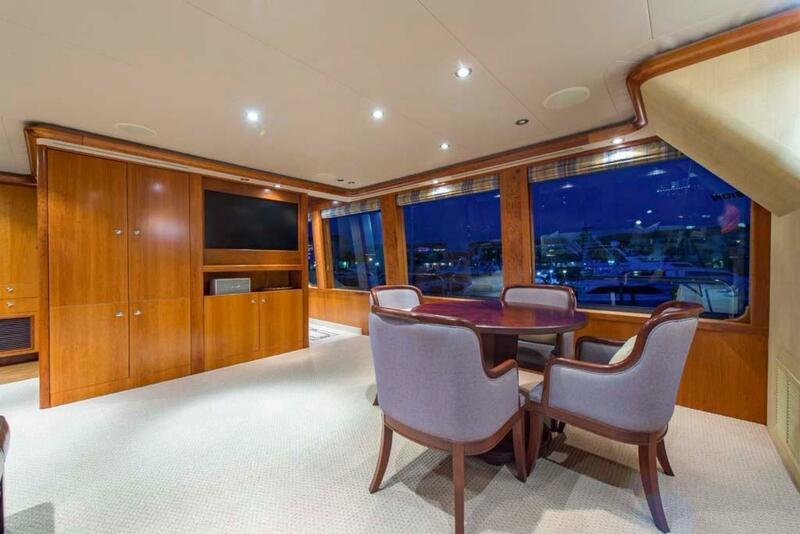 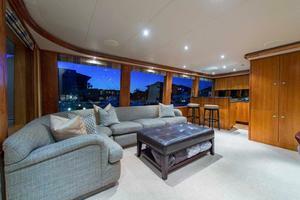 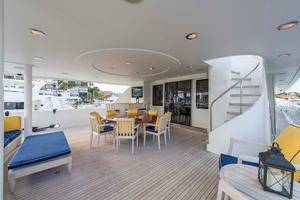 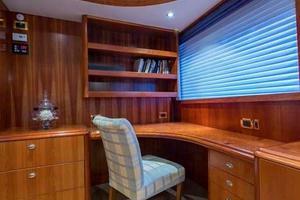 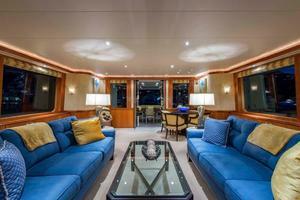 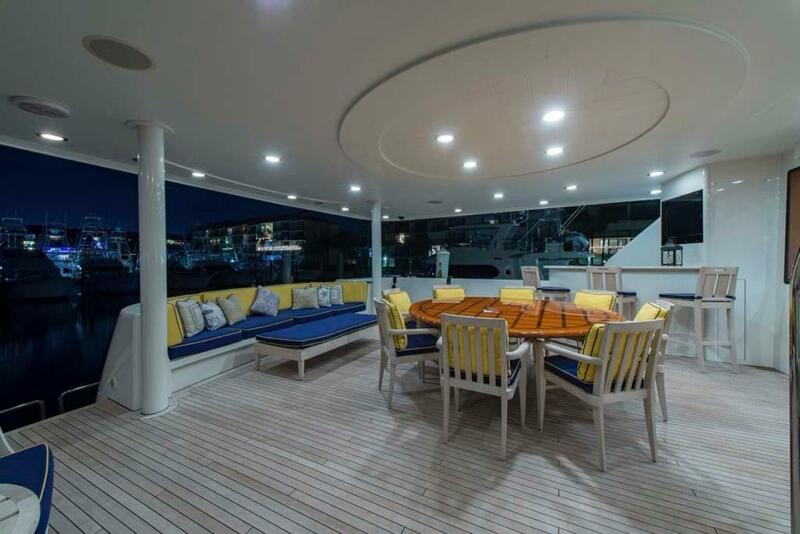 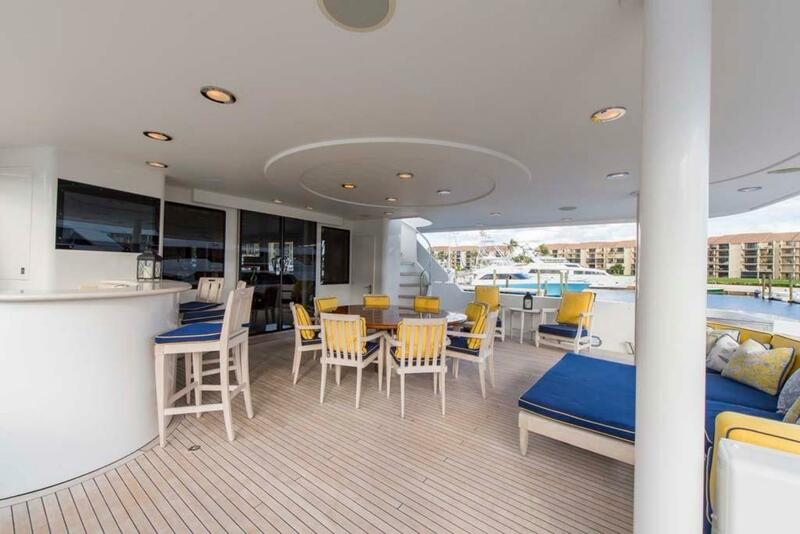 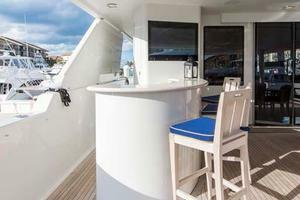 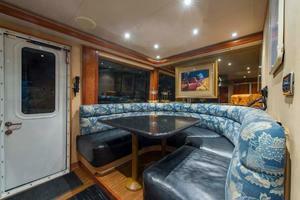 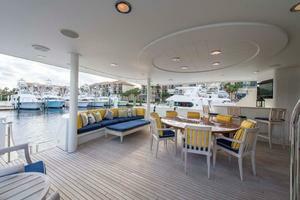 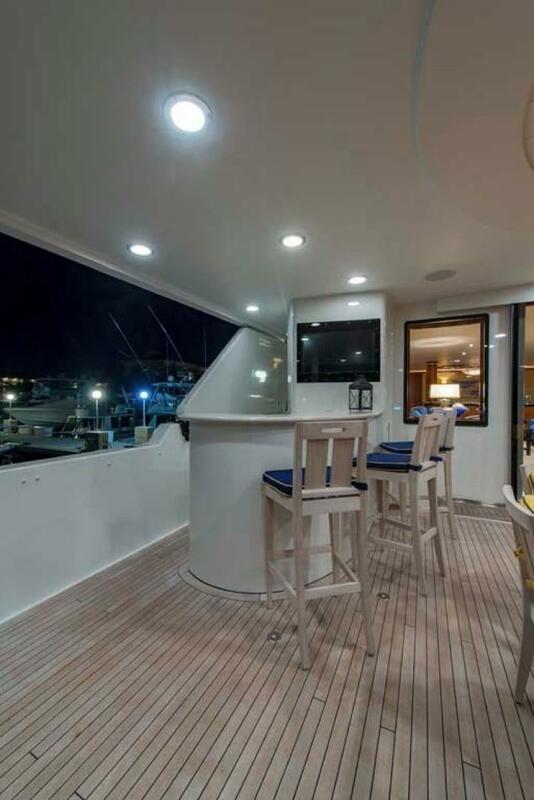 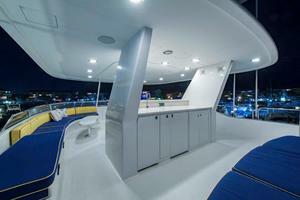 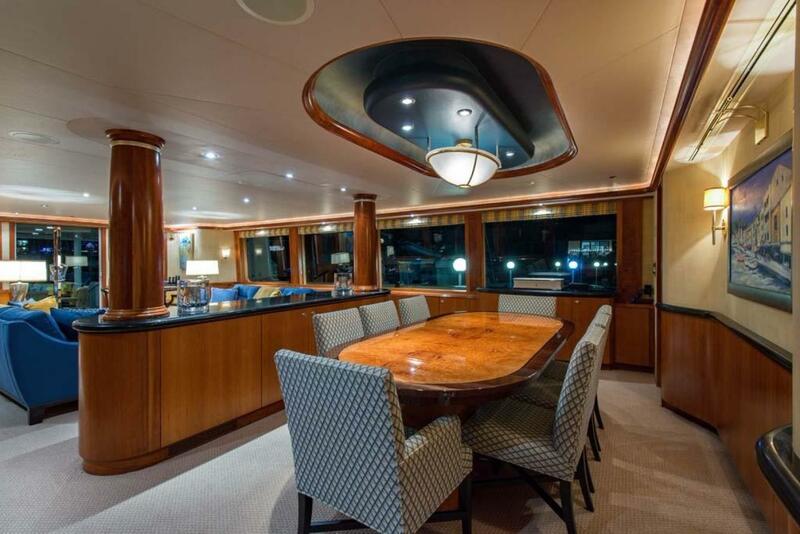 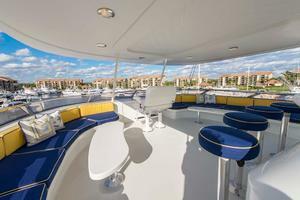 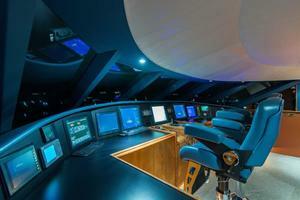 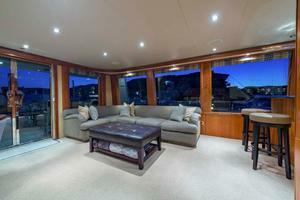 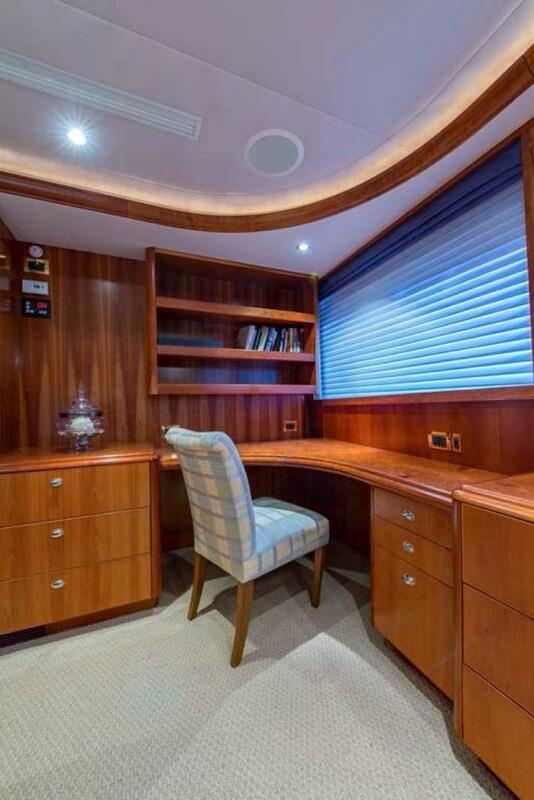 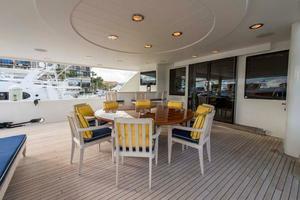 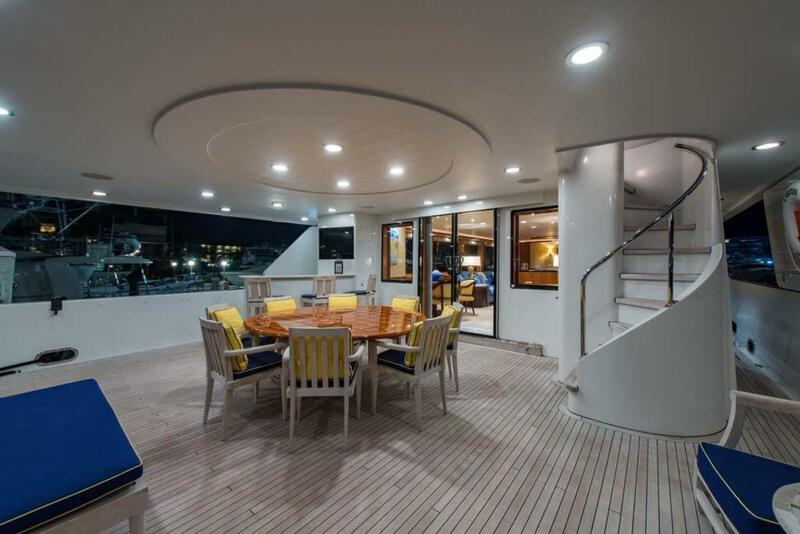 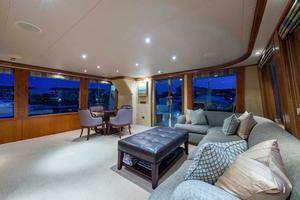 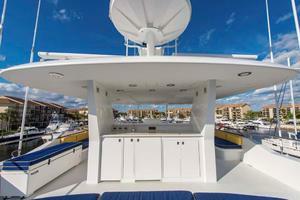 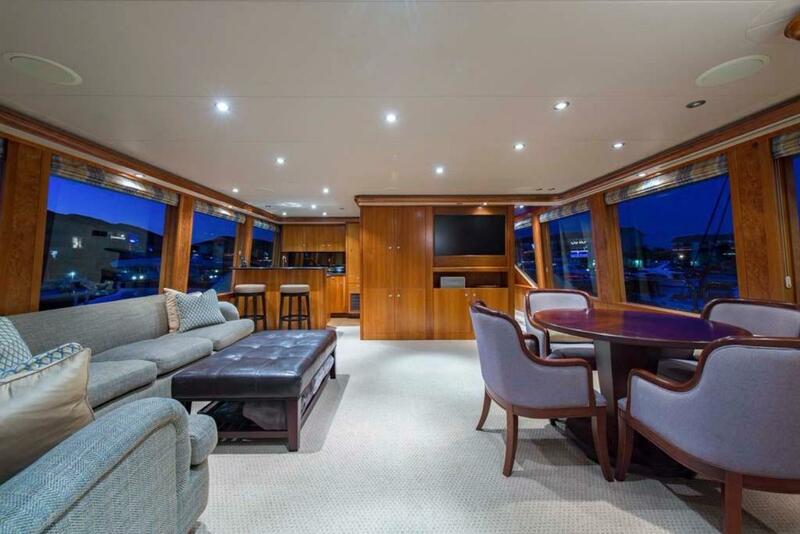 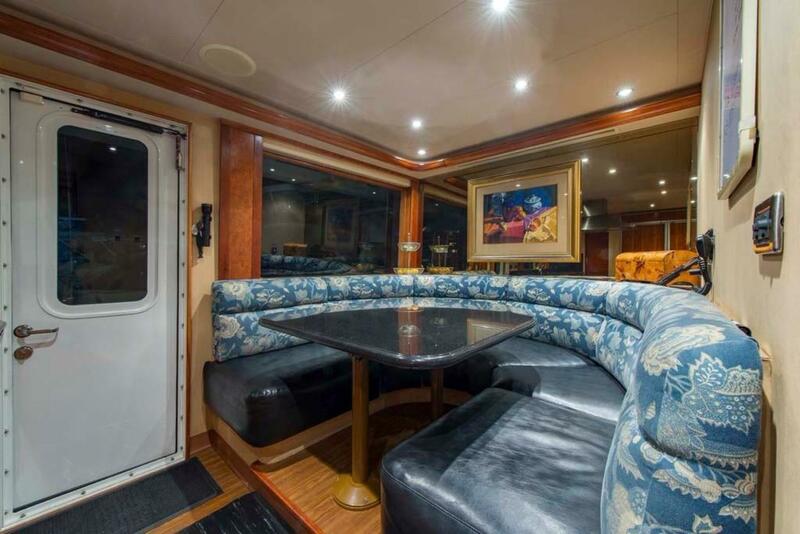 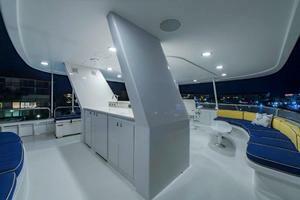 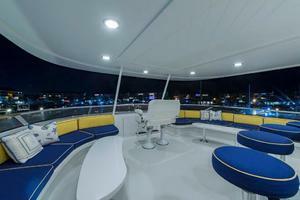 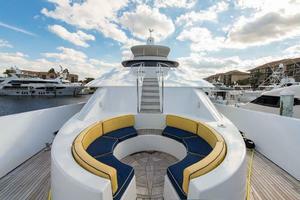 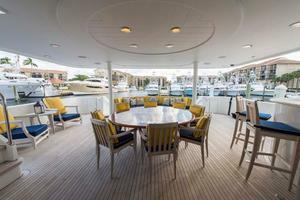 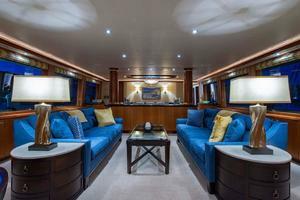 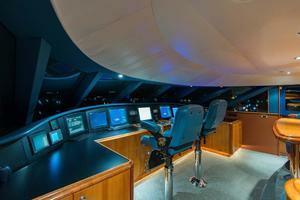 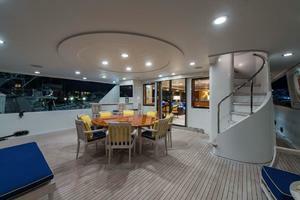 Looking all the way aft on the port side there is a game table with four upholstered chairs. 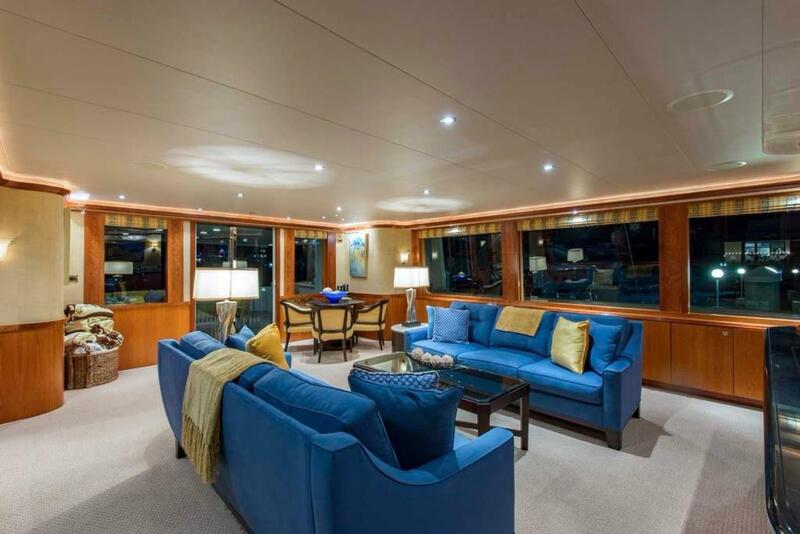 Moving forward, one finds two comfortable chenille covered sofas on both sides facing each other creating a casual conversation area. 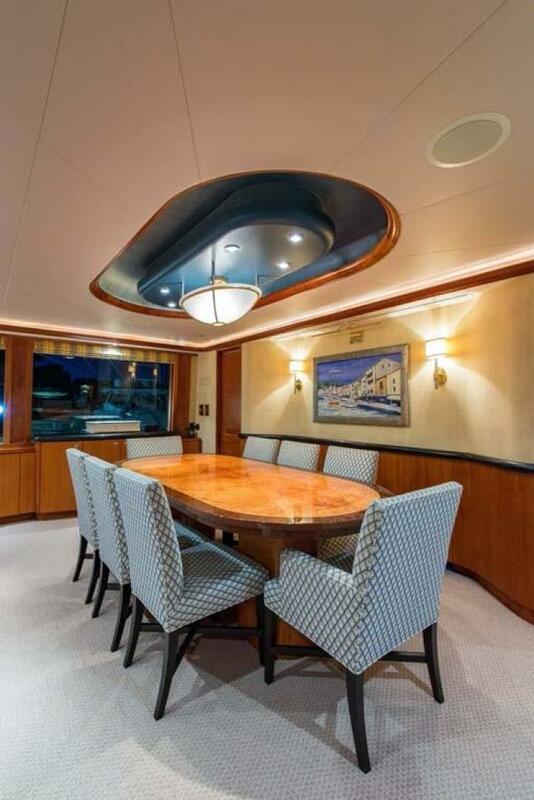 A 40-inch PAL/NTSC LCD Flat Screen TV hidden in a cherry wood buffet with granite top (raised and lowered by remote) separates the Salon from the dining area, where the dining table can accommodate 10 guests. 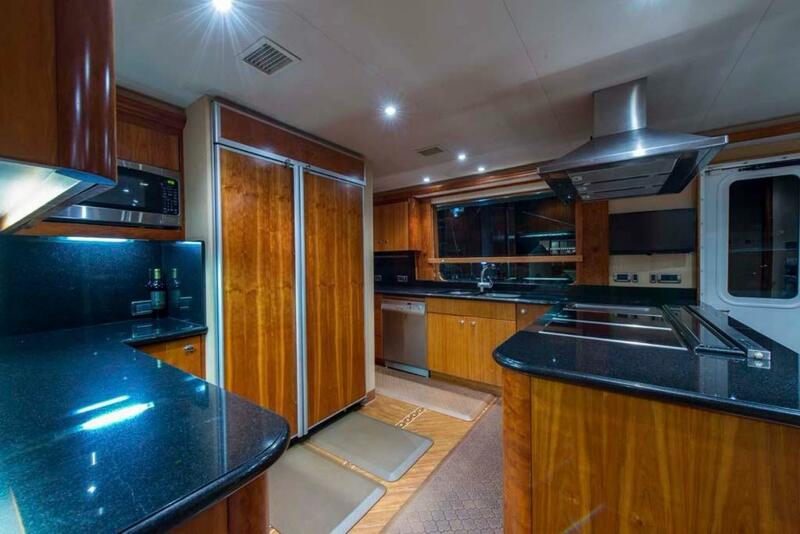 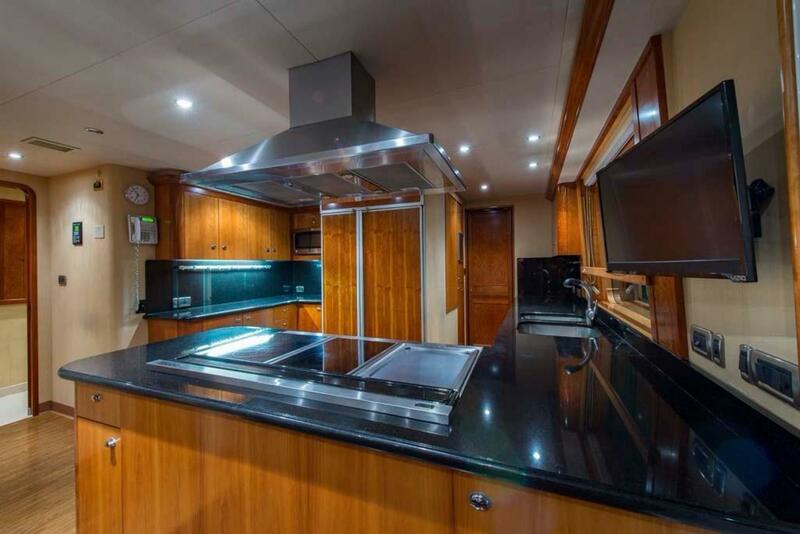 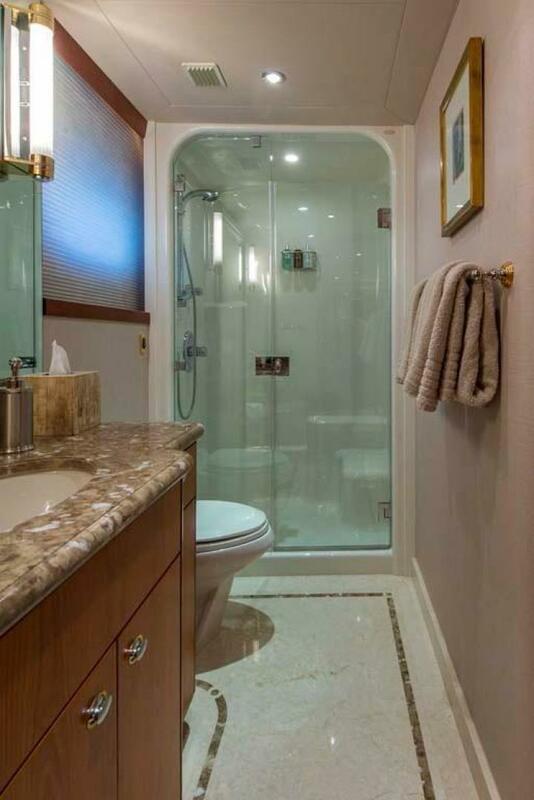 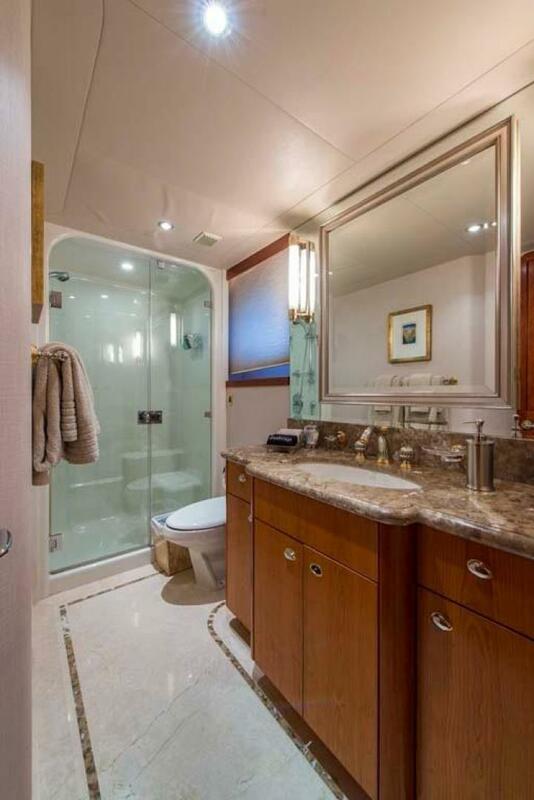 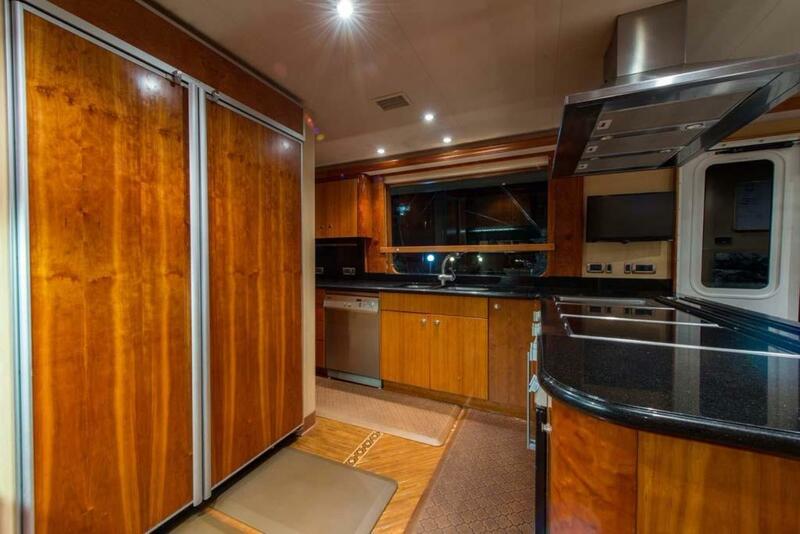 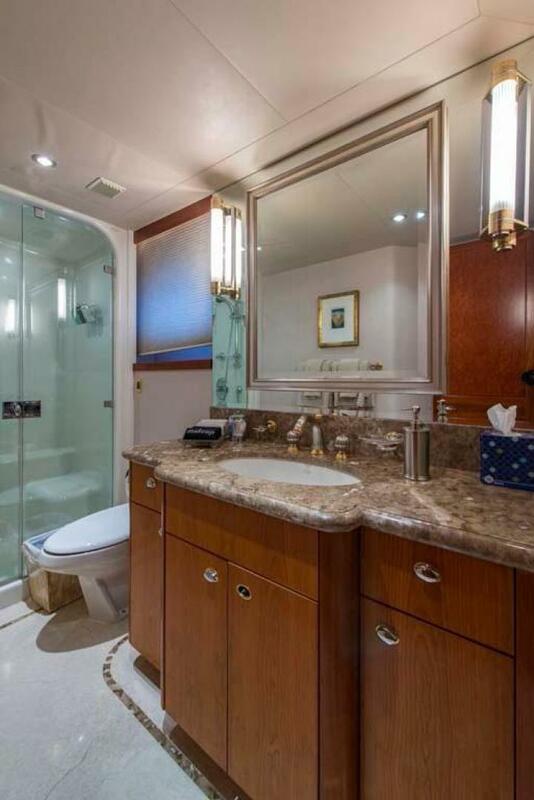 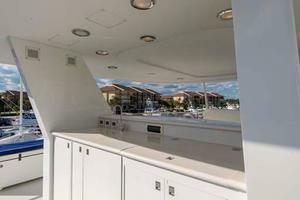 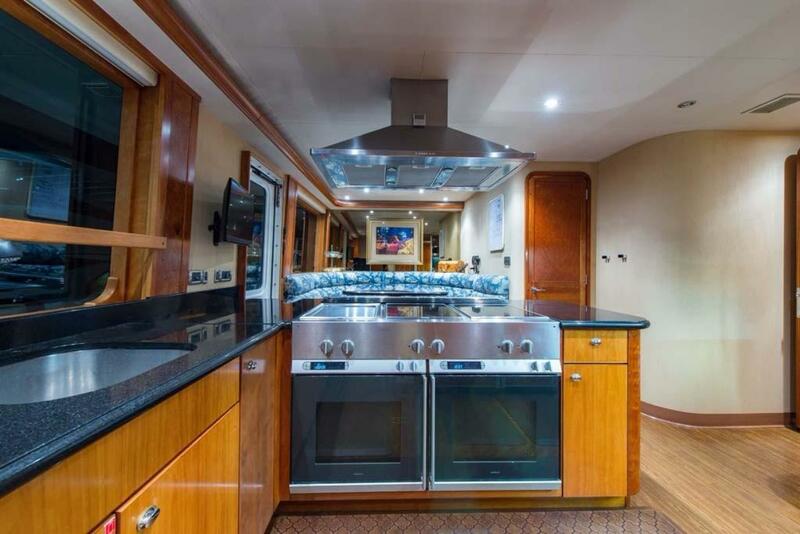 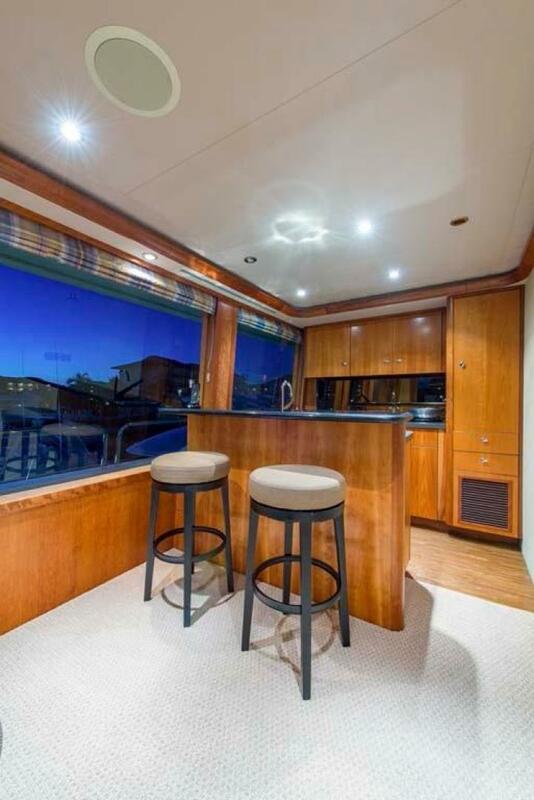 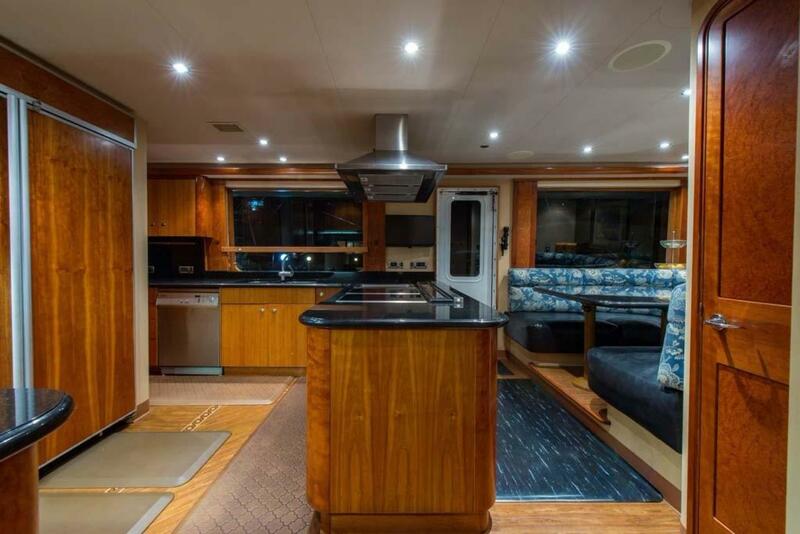 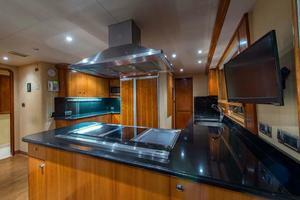 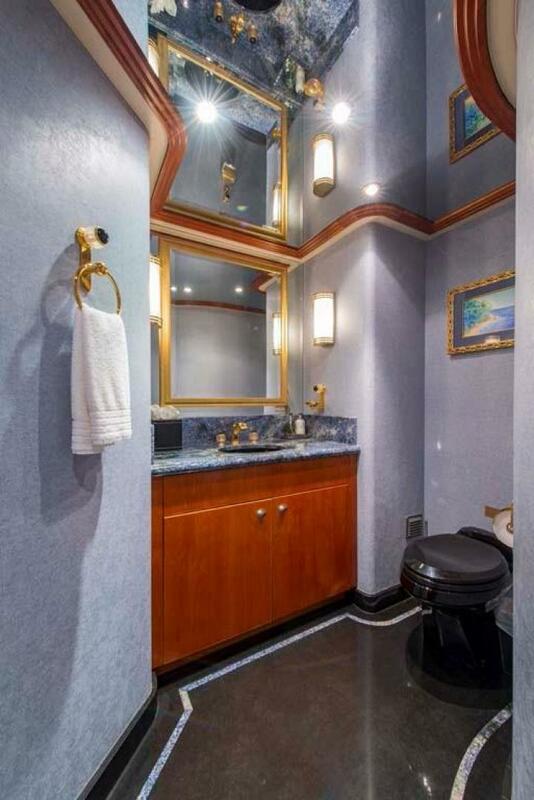 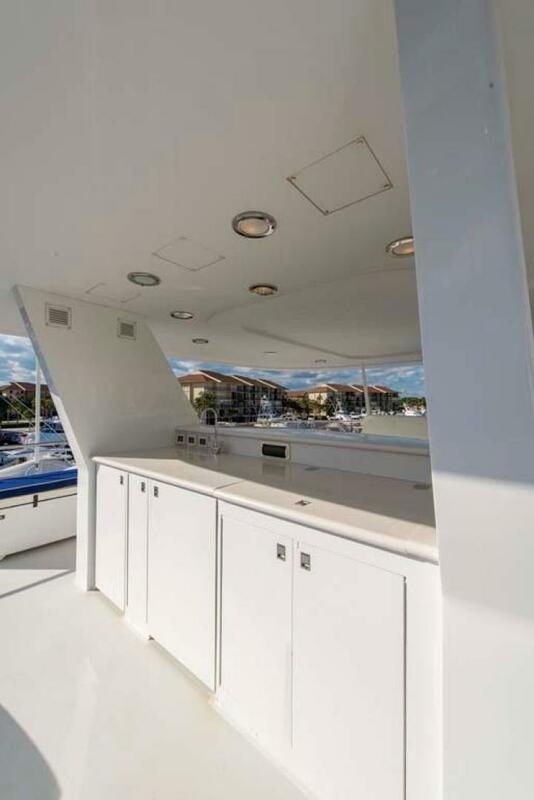 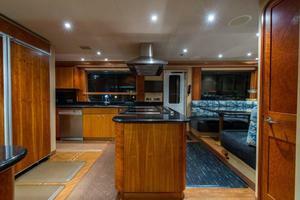 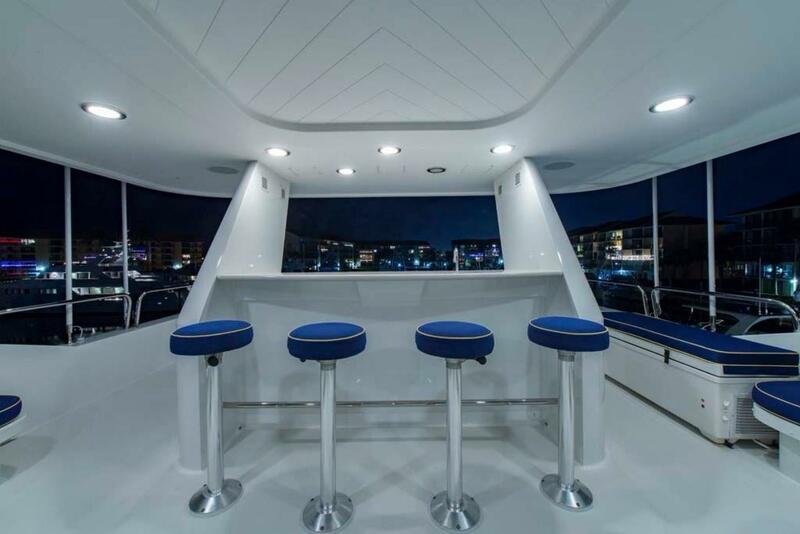 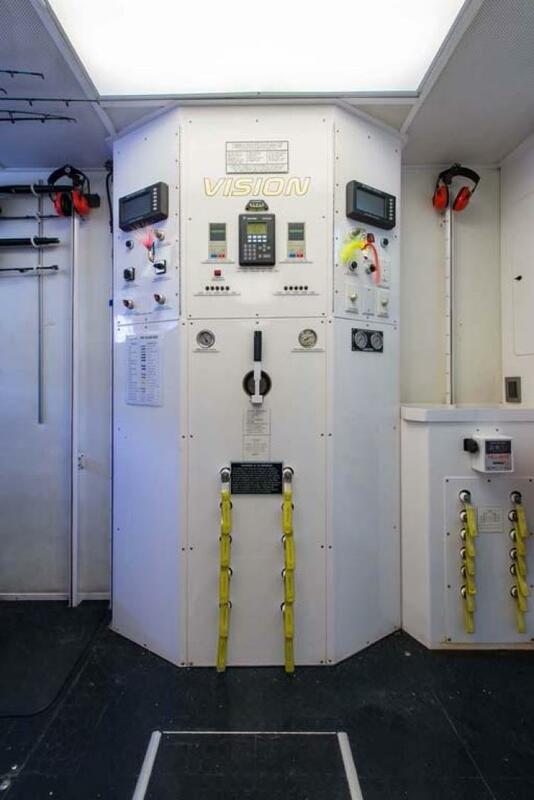 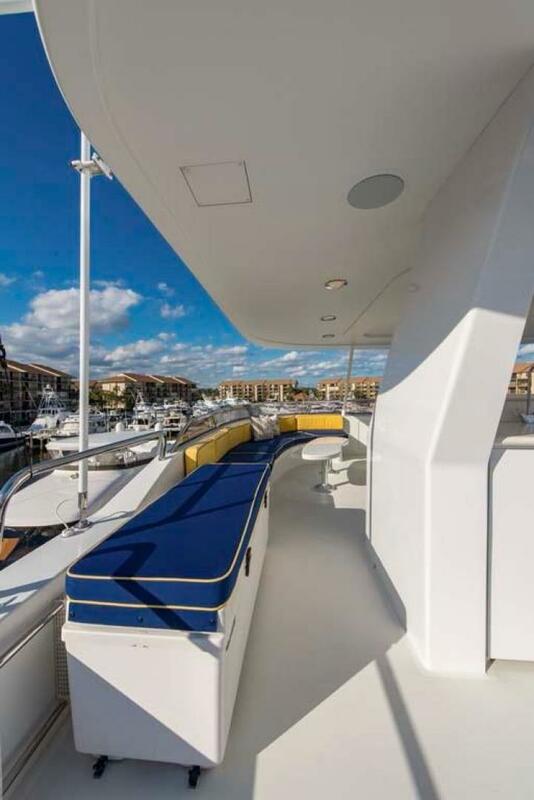 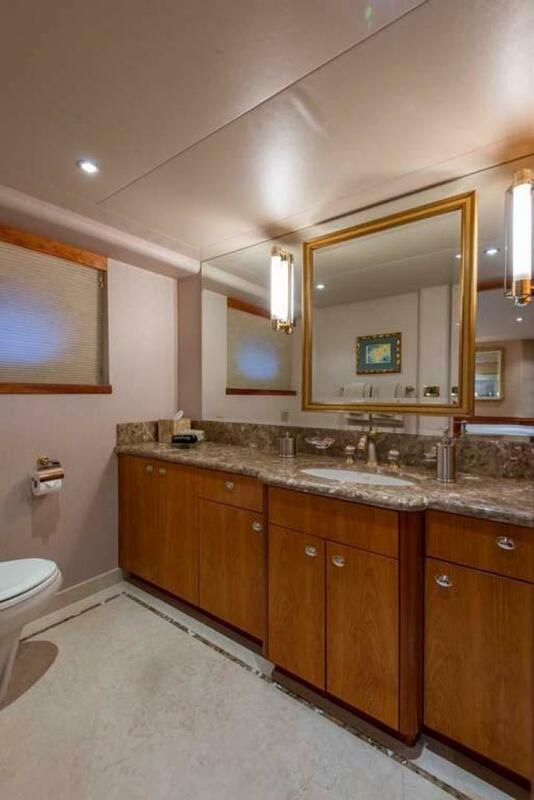 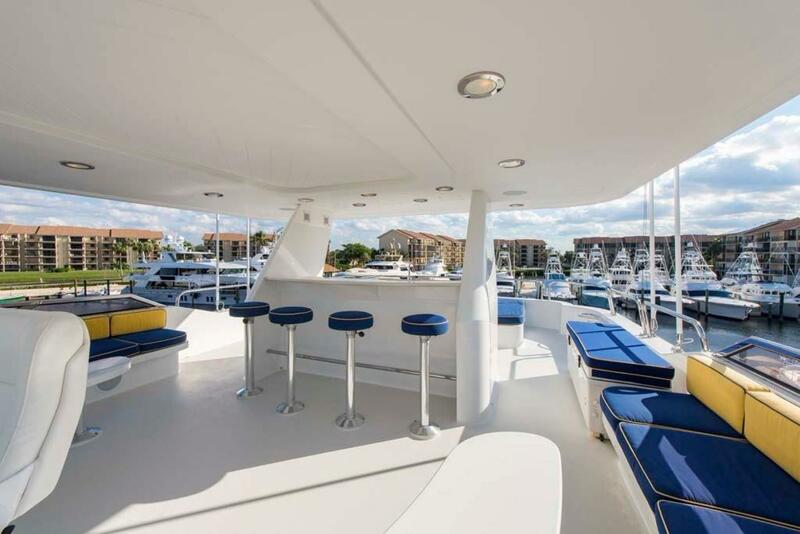 Forward to port is the Galley with plenty of storage and black granite countertops, nicely appointed with stainless steel professional appliances including a six-burner stove with pop up vent. 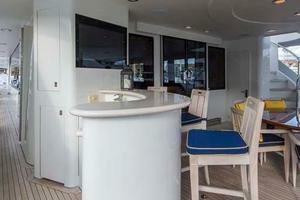 The U-shaped dinette nook has ample seating and is perfect for a casual breakfast or lunch. 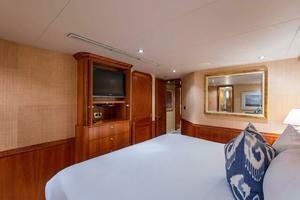 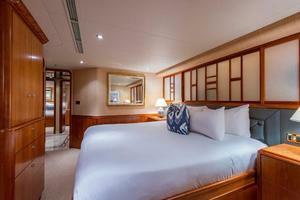 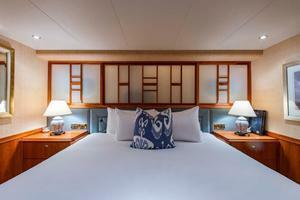 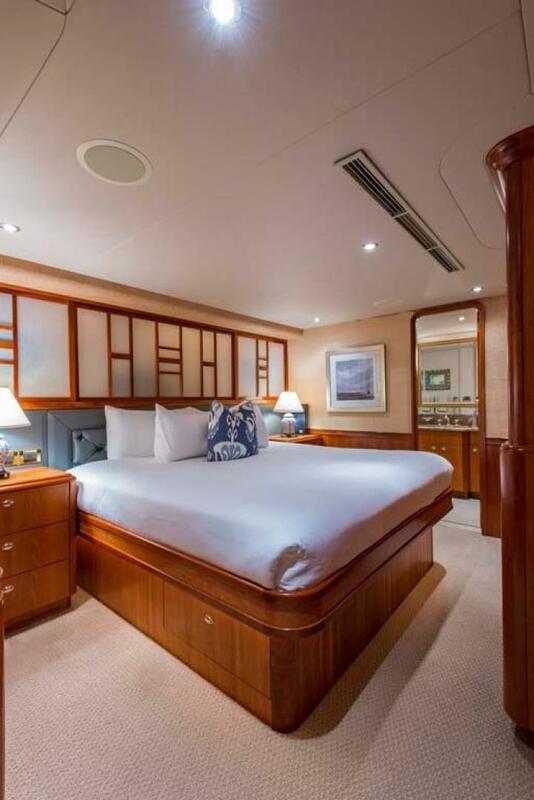 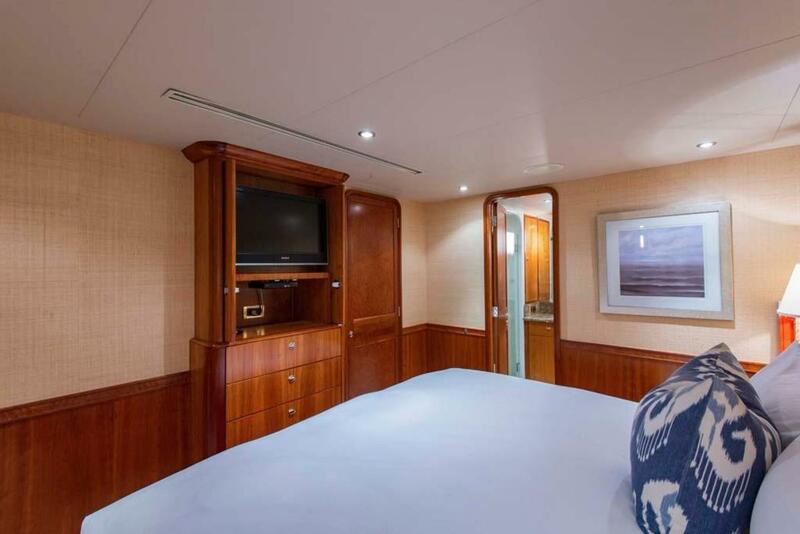 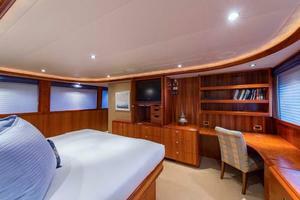 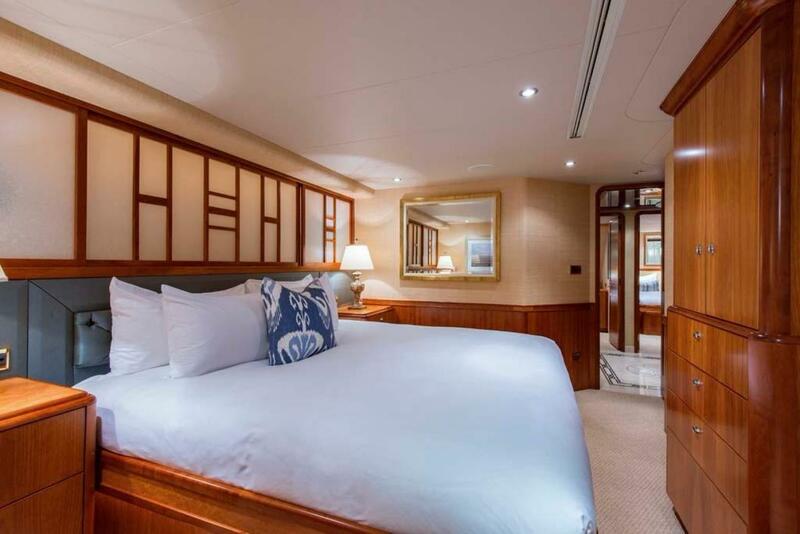 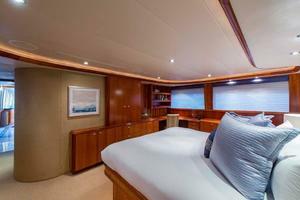 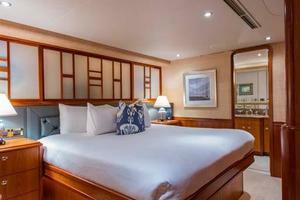 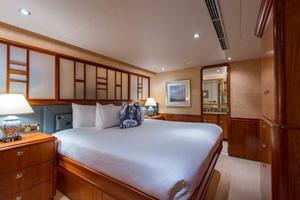 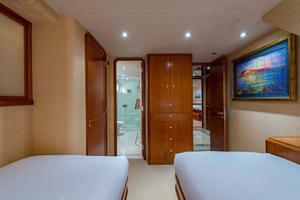 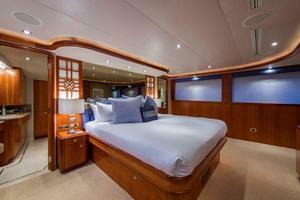 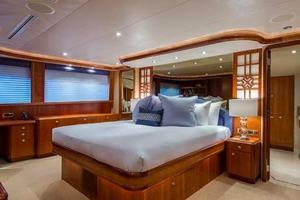 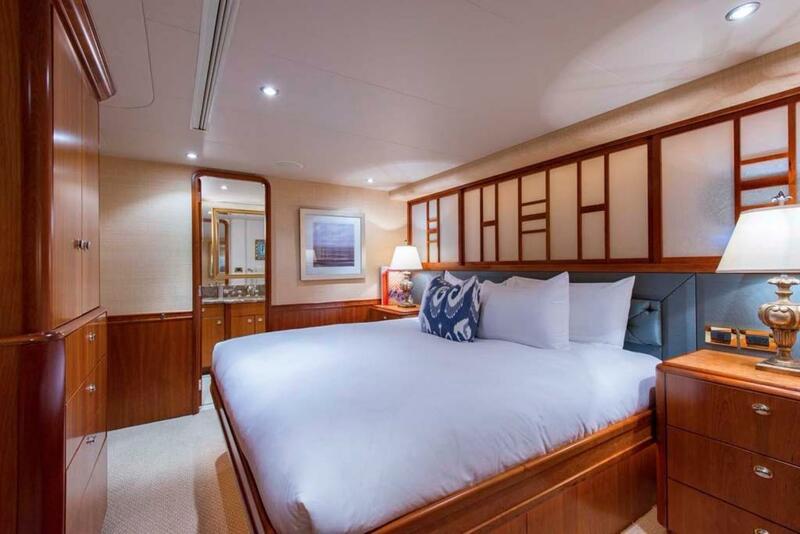 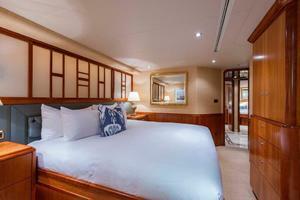 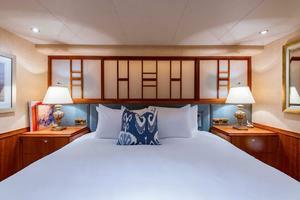 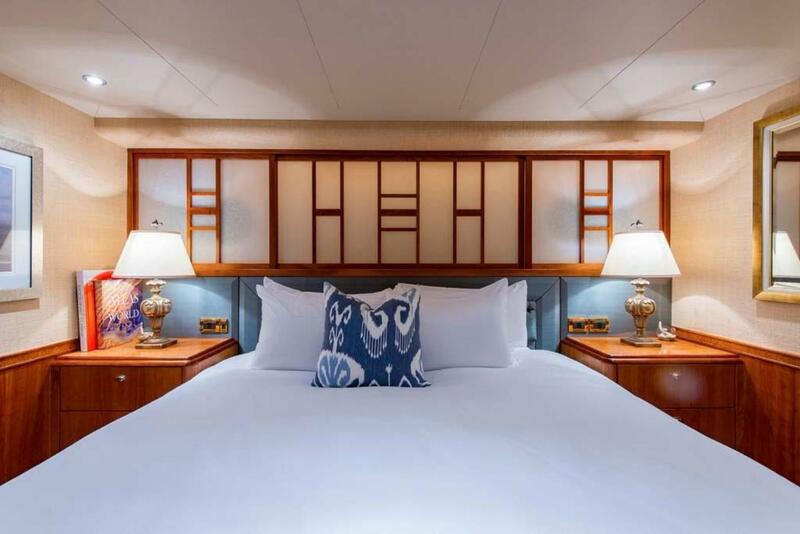 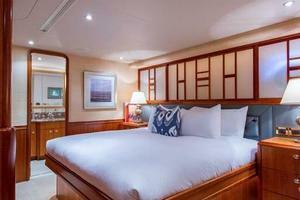 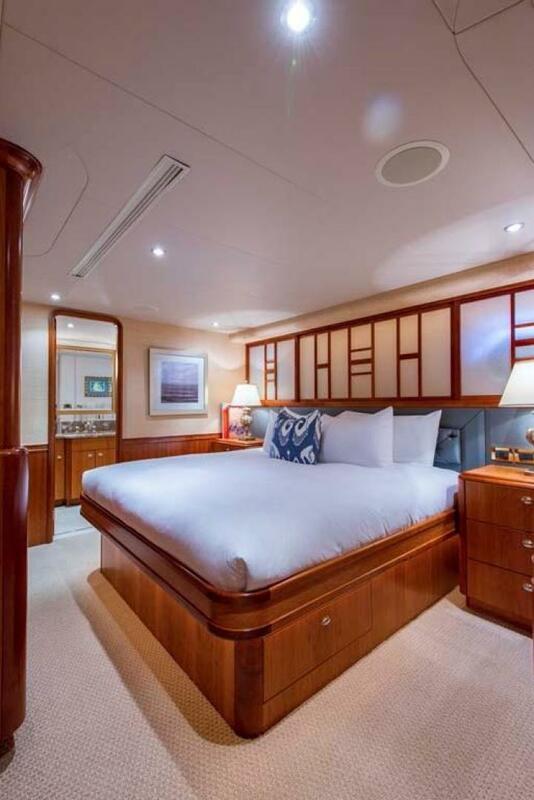 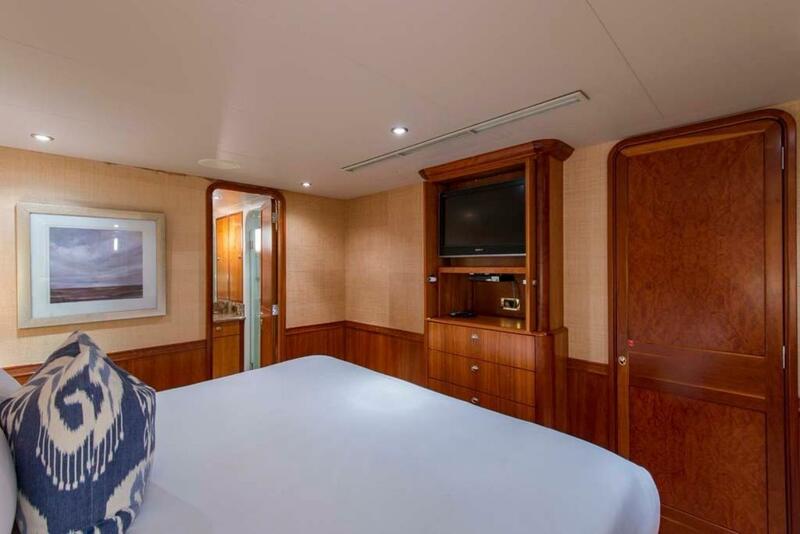 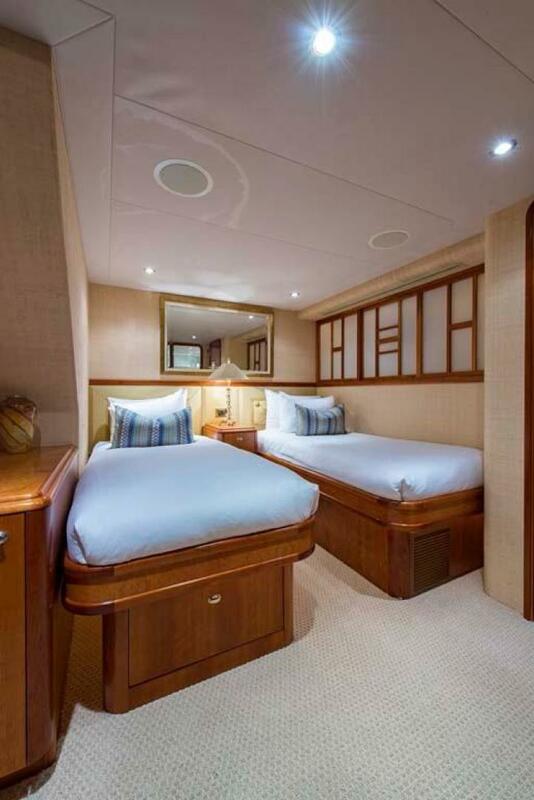 Moving forward to the on-deck Master Stateroom you’ll find a centerline king-sized bed. 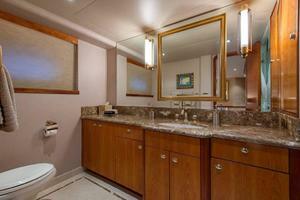 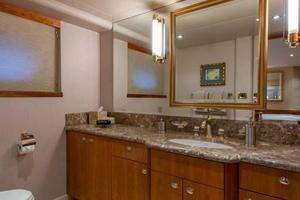 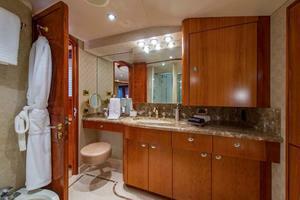 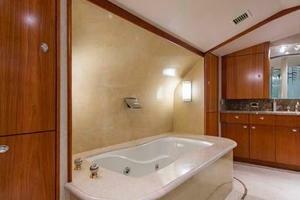 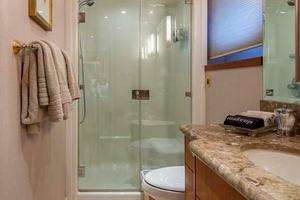 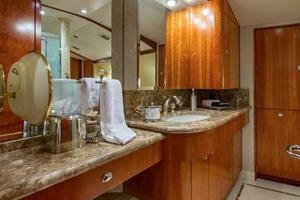 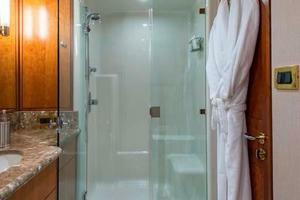 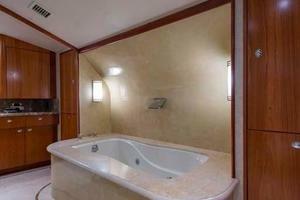 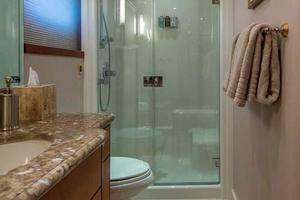 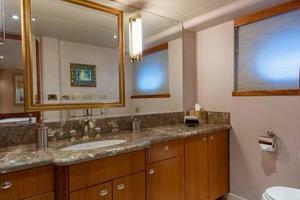 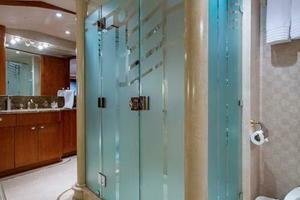 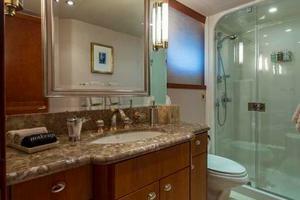 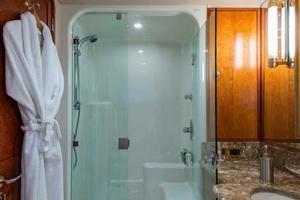 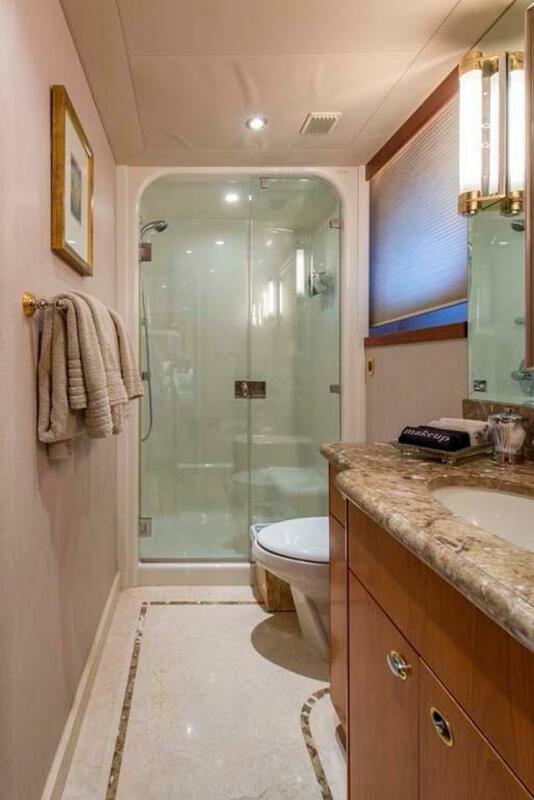 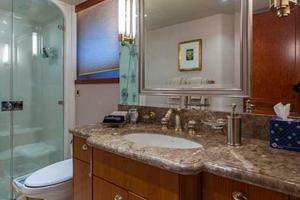 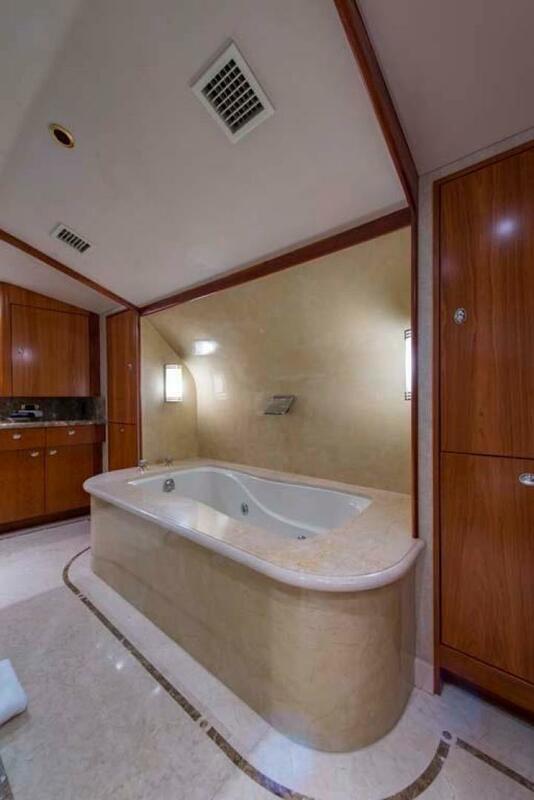 The master bathroom has a whirlpool bath, a glass enclosed shower, his and her vanities and Crema Marfil marble tile. 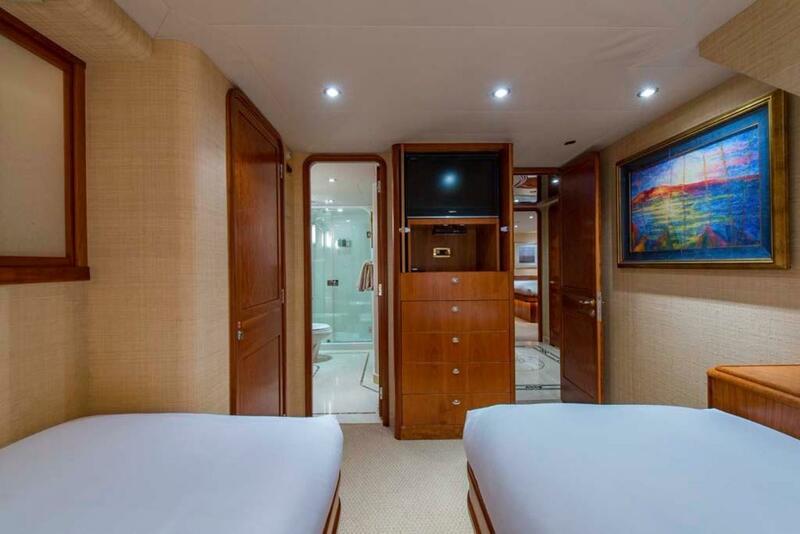 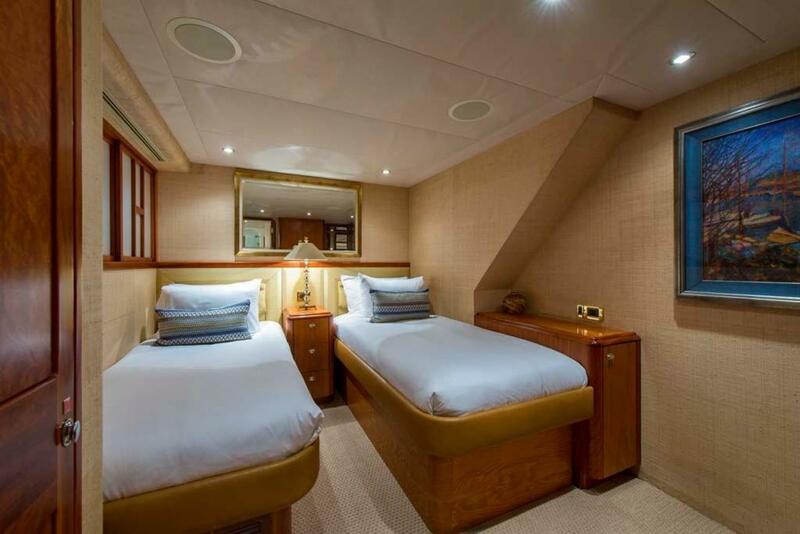 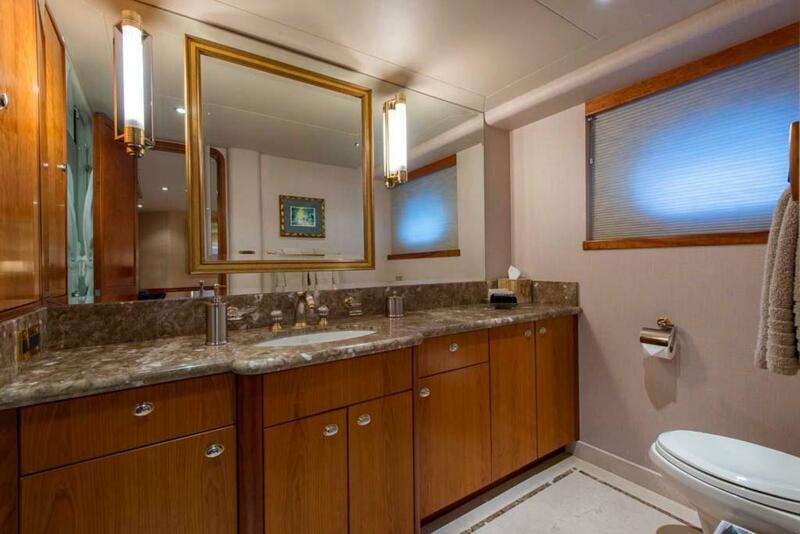 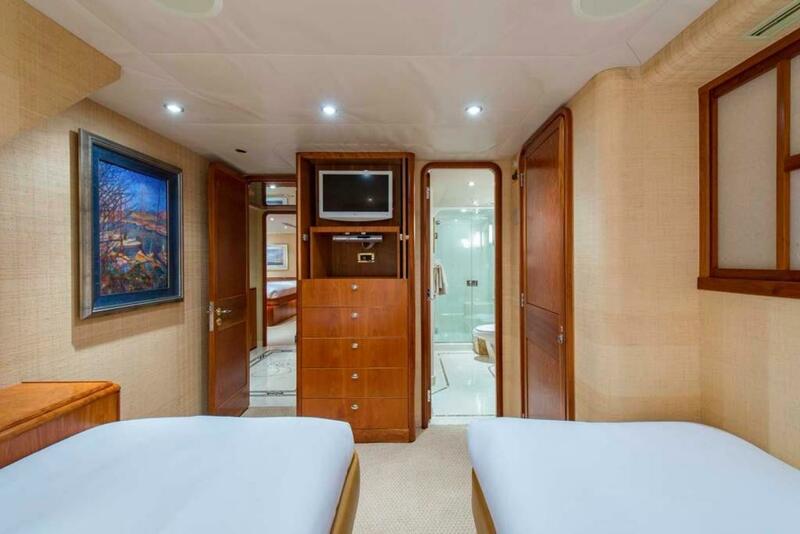 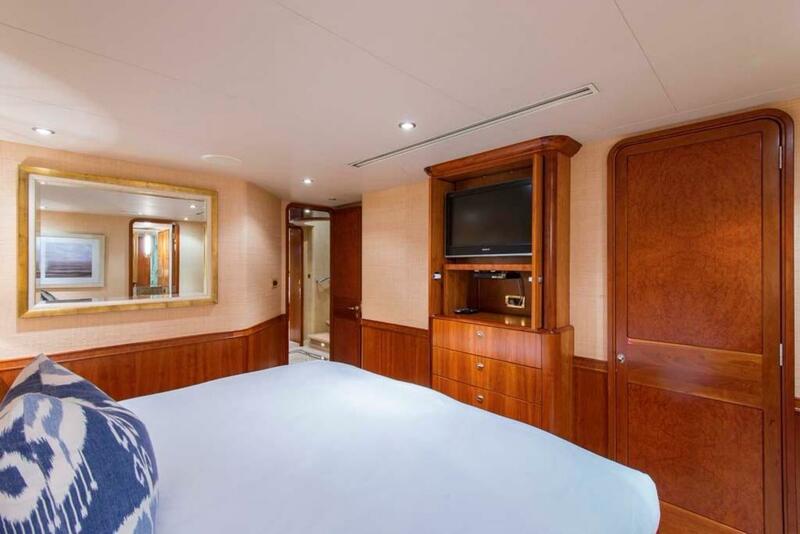 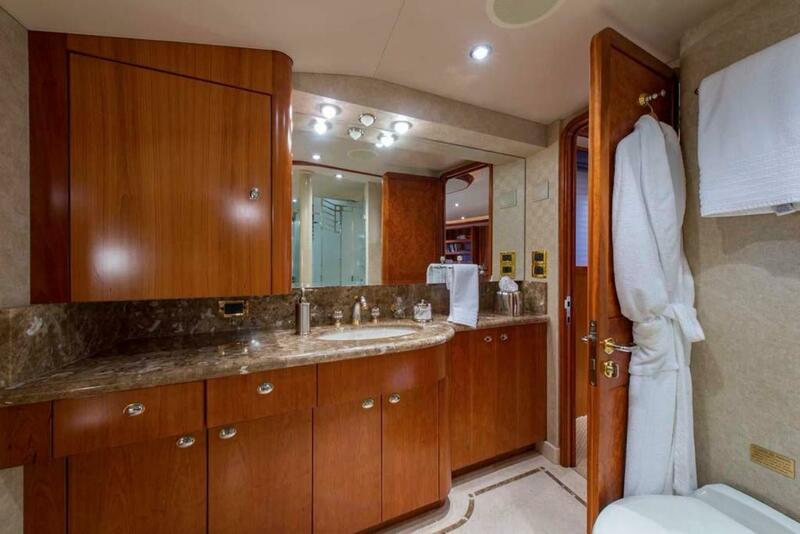 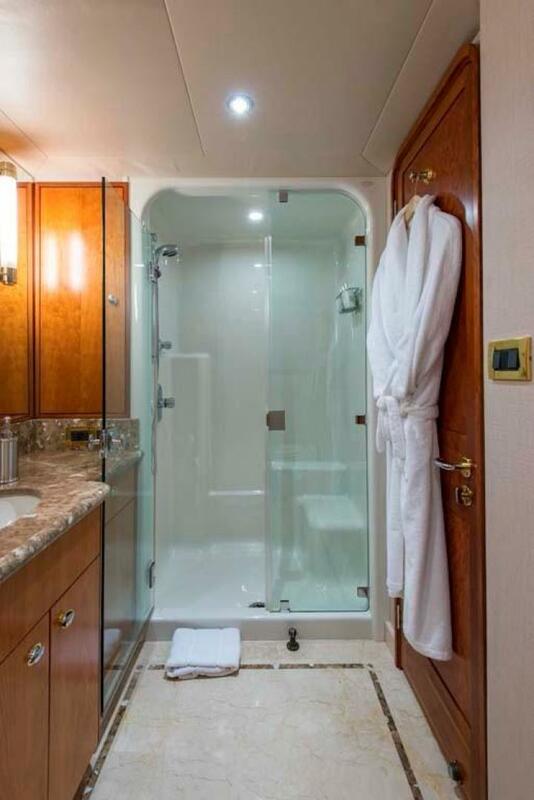 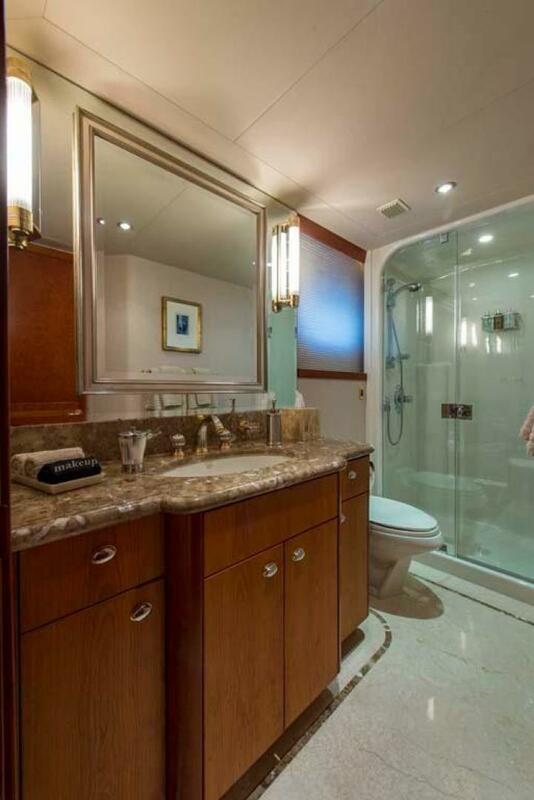 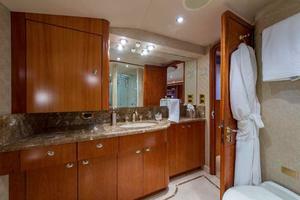 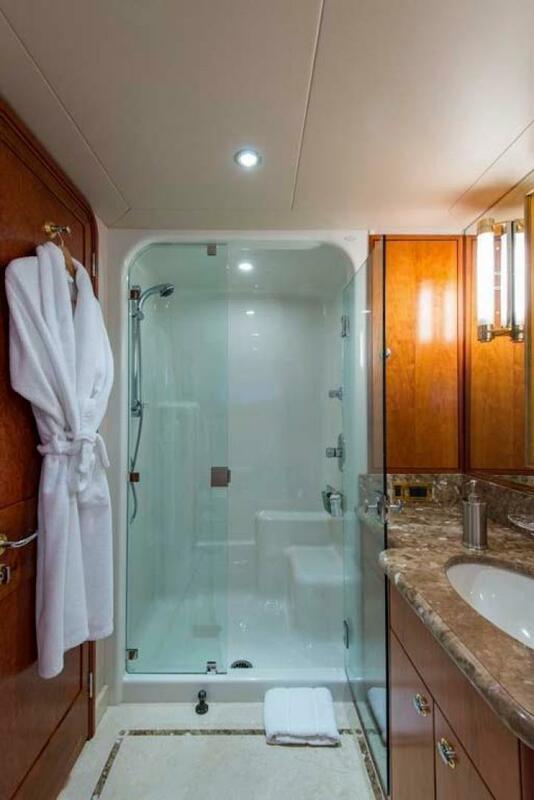 Aft of the Master are mid-ship stairs that lead down to the four Guest Staterooms, each with ensuite head and enclosed shower. 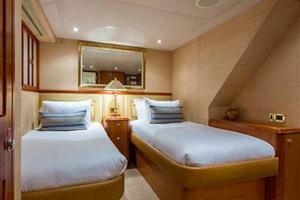 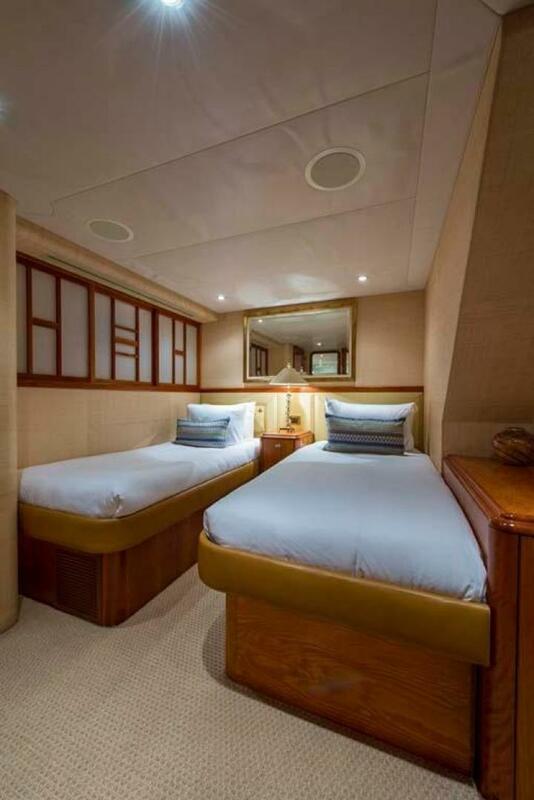 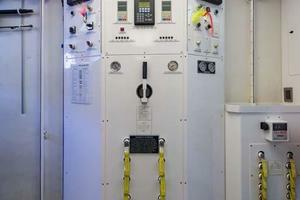 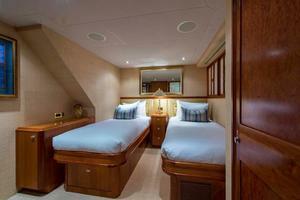 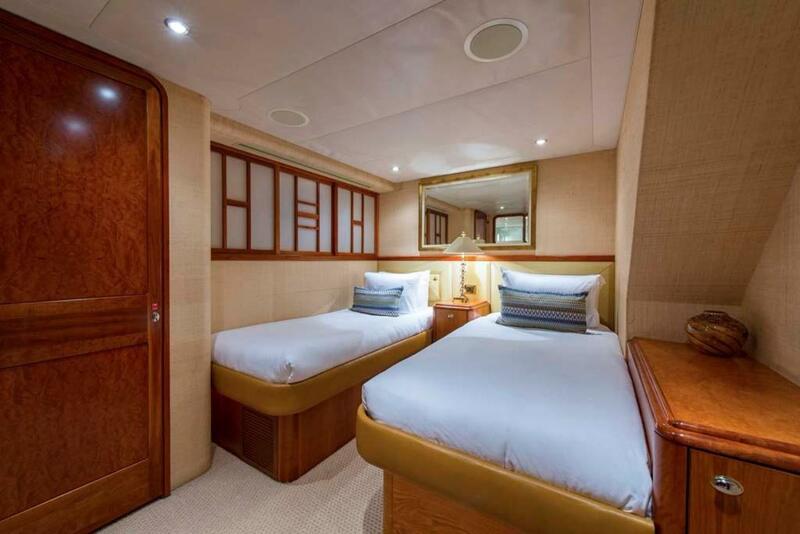 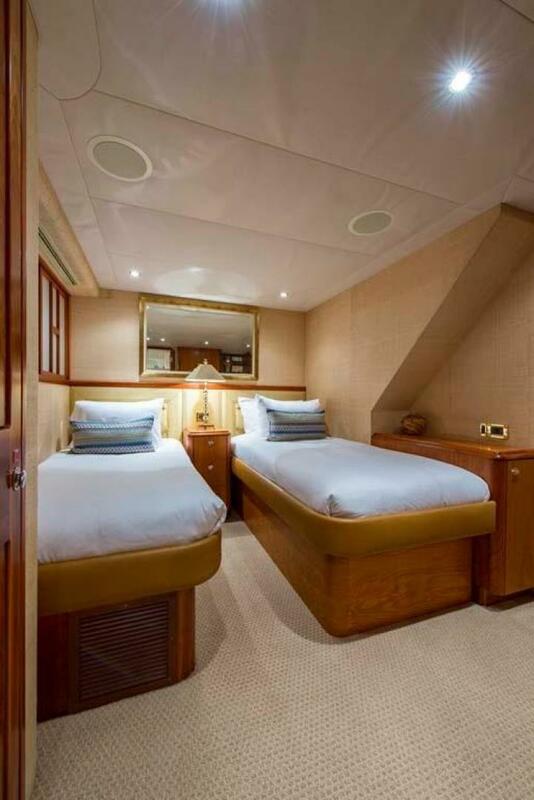 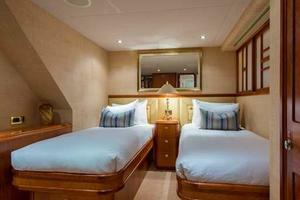 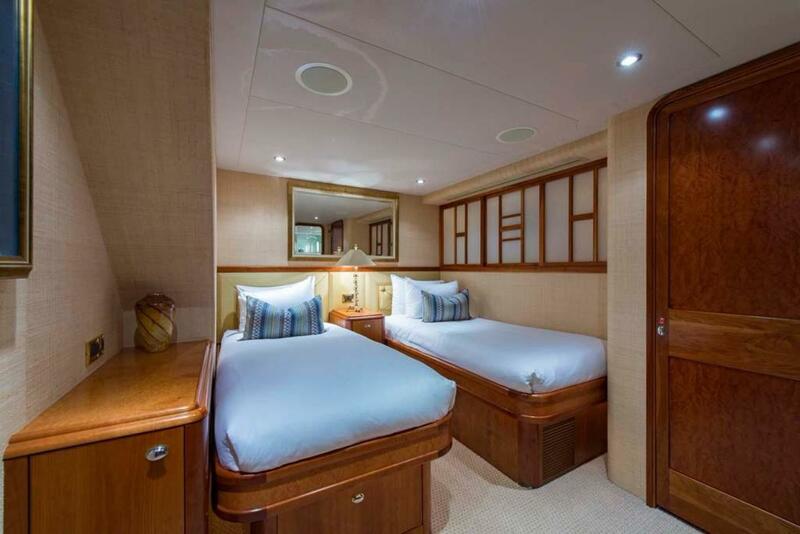 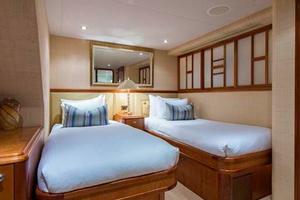 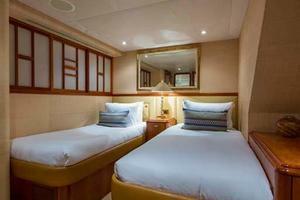 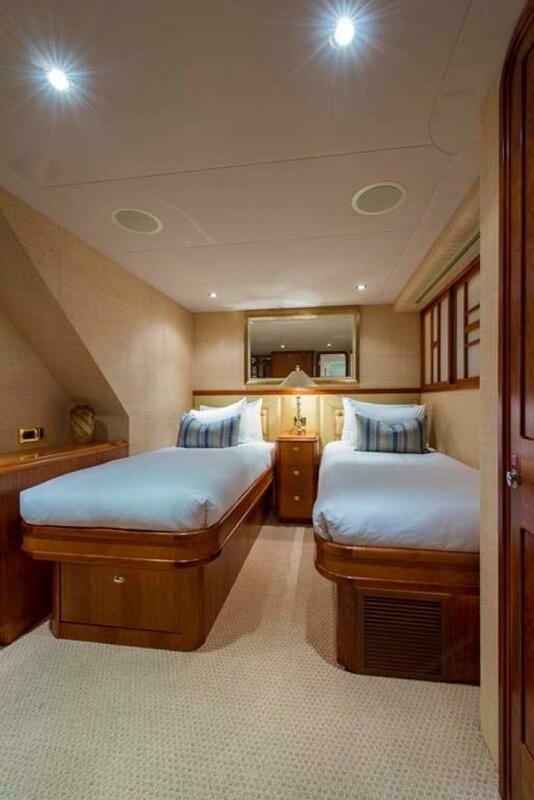 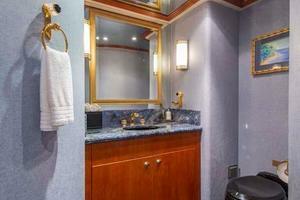 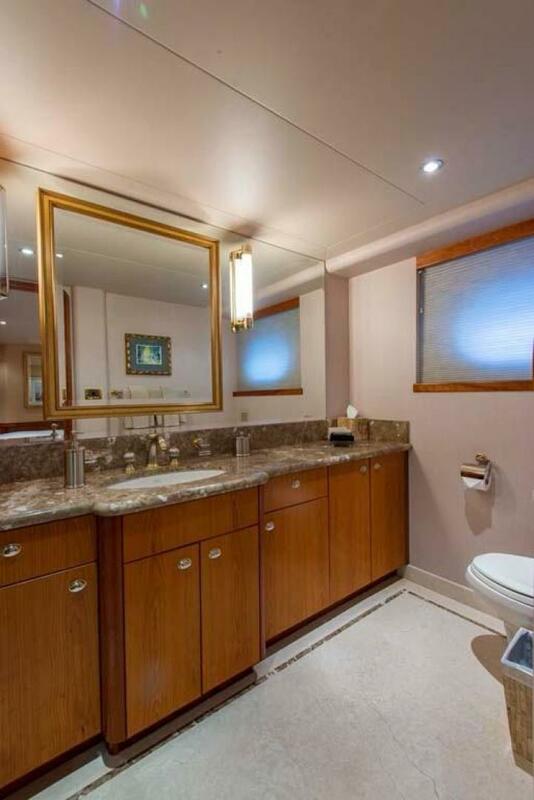 There are Two (2) king berths and two (2) twin berth staterooms. 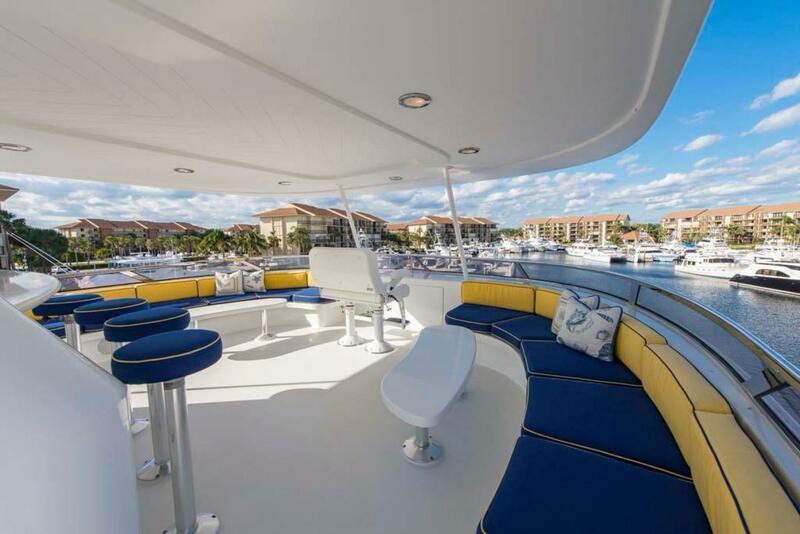 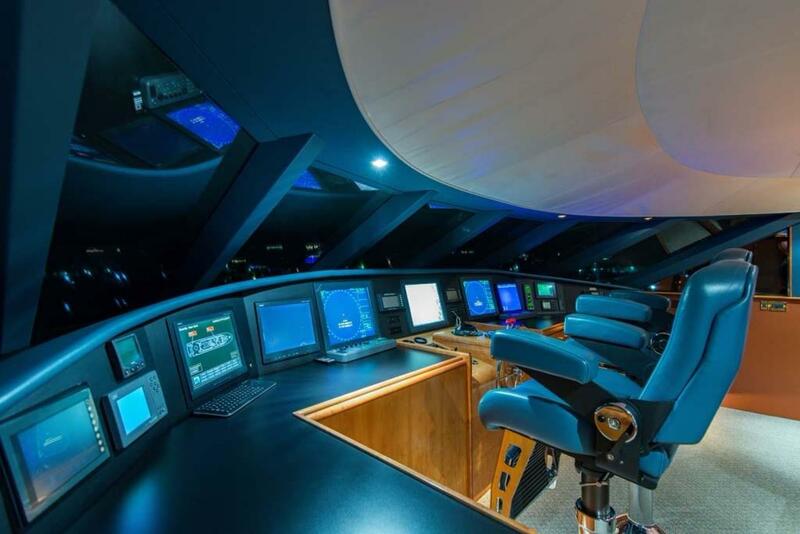 Mid ship stairs lead you back up and forward to the Pilothouse where there is semi-circular seating for guests to enjoy the view while cruising. 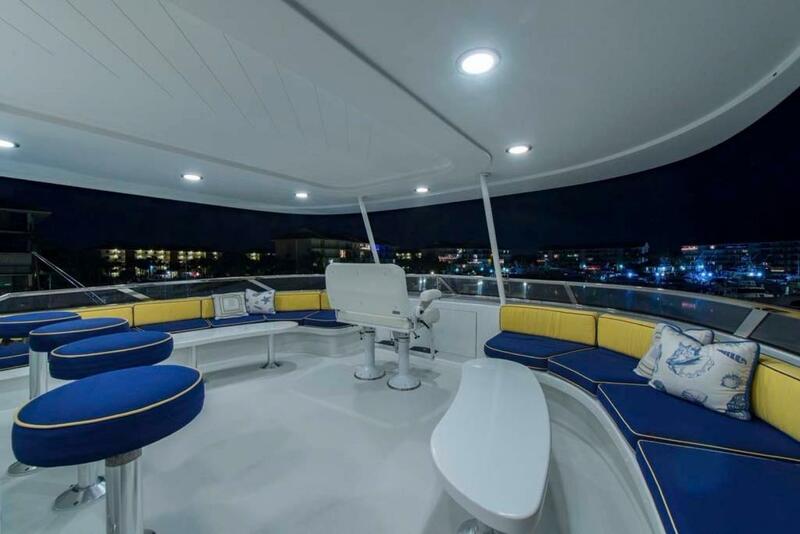 Aft to the Sky Lounge is a complete entertainment center including a 42-inch flat screen TV, wet bar, game table, and large windows offering a panoramic view. 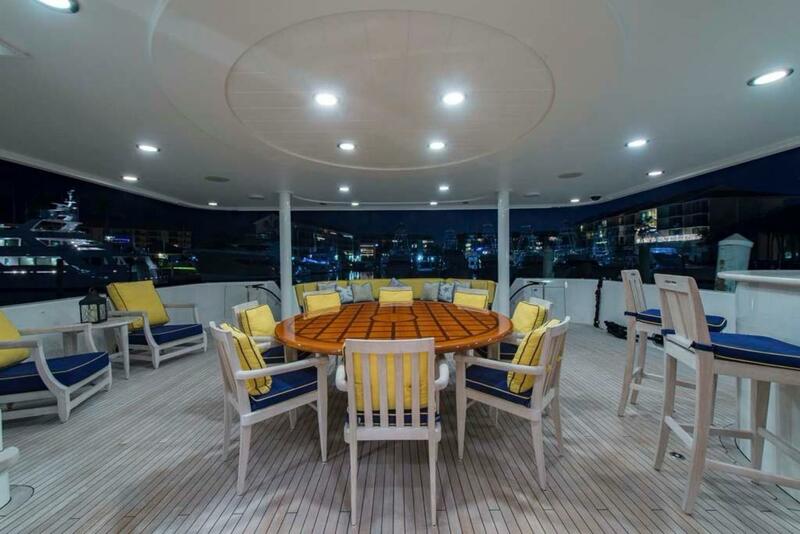 72” round Westcoast Teak dining table with fixed polished stainless steel pedestal by Crown, Ltd.
(2) 65KW 1800 RPM Northern Lights Generators with sound shield, muffler, exhaust water separator and Pilothouse remote start. 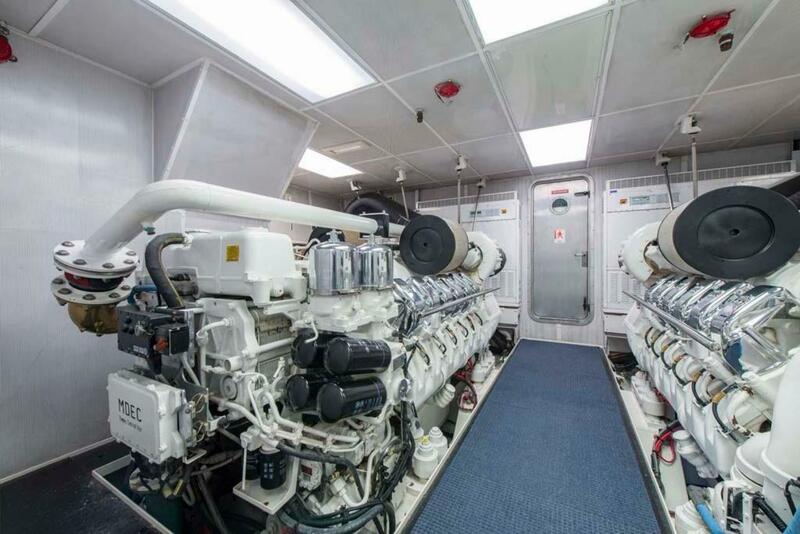 Port generator has 4796 hours SMOH in February 2016, and starboard generator has 5353 hours SMOH in February 2016. 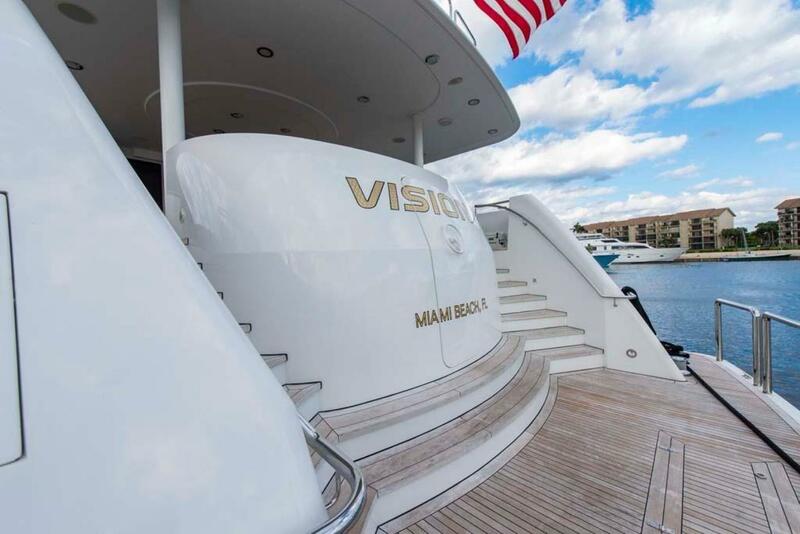 A detailed list of exclusions will be provided at the time of sale upon written request.